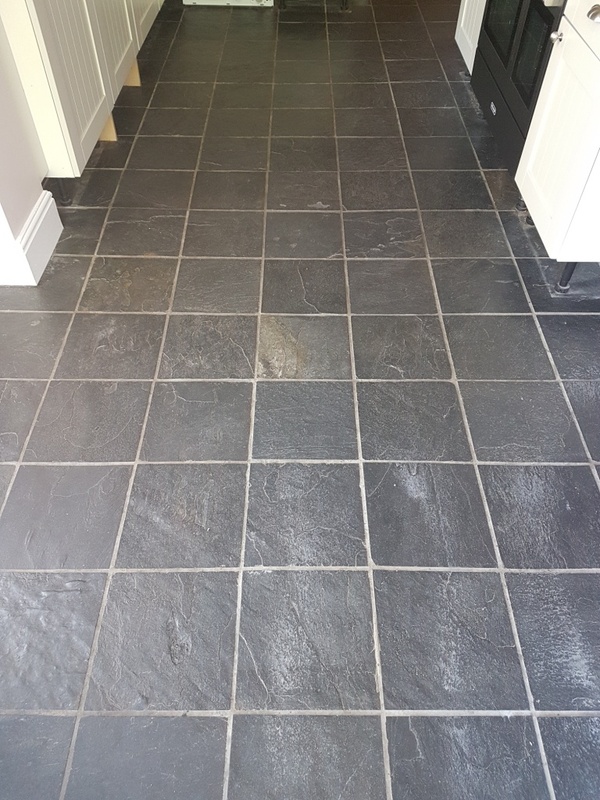 African Slate has a striking realism to it and its natural mix of light and dark shades is difficult to compare to anything else. 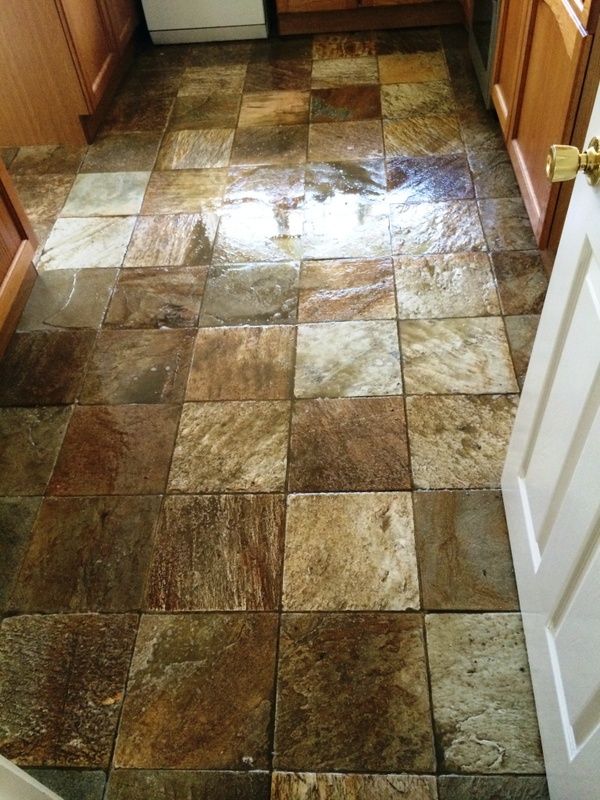 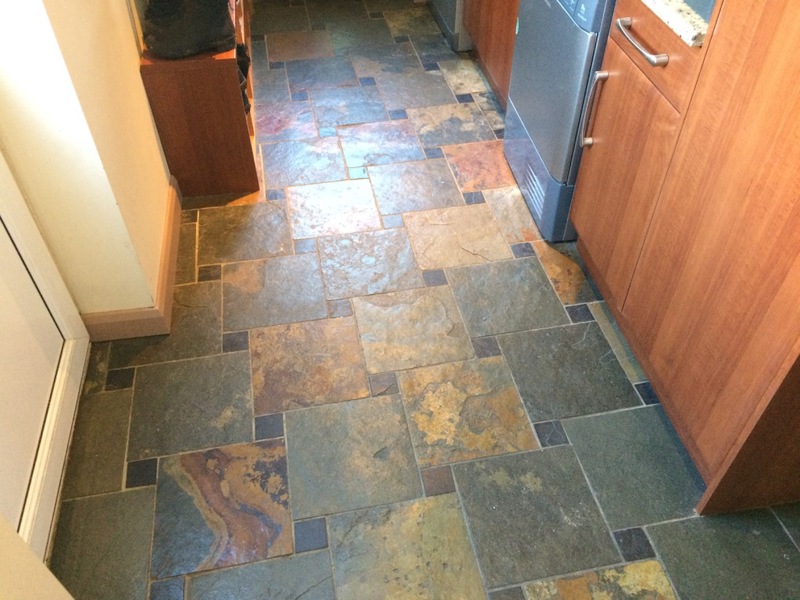 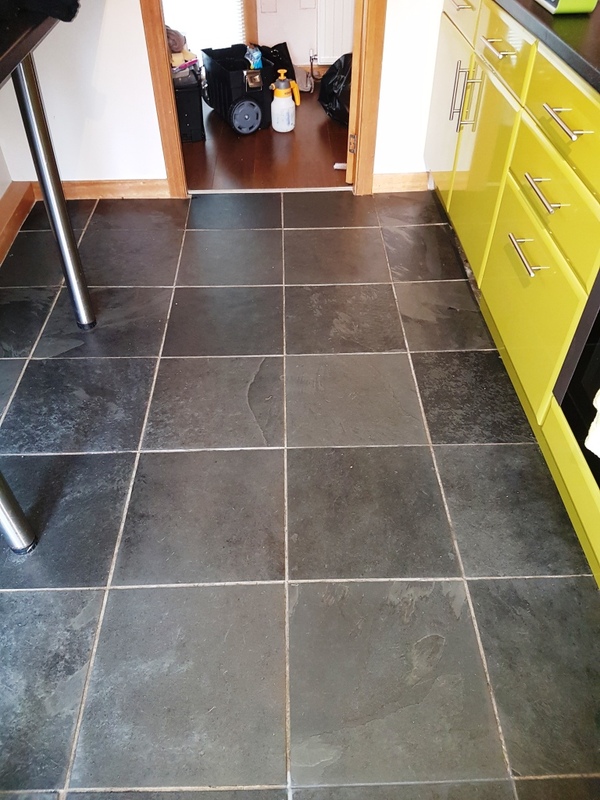 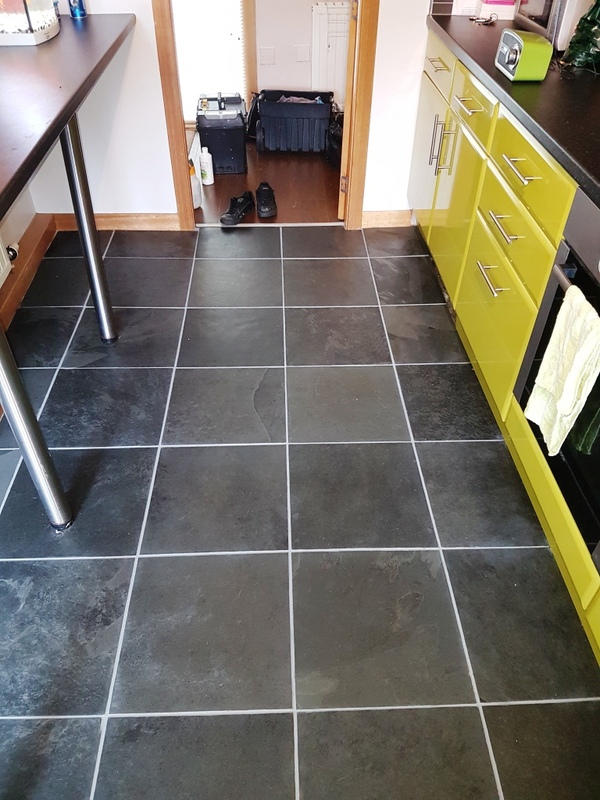 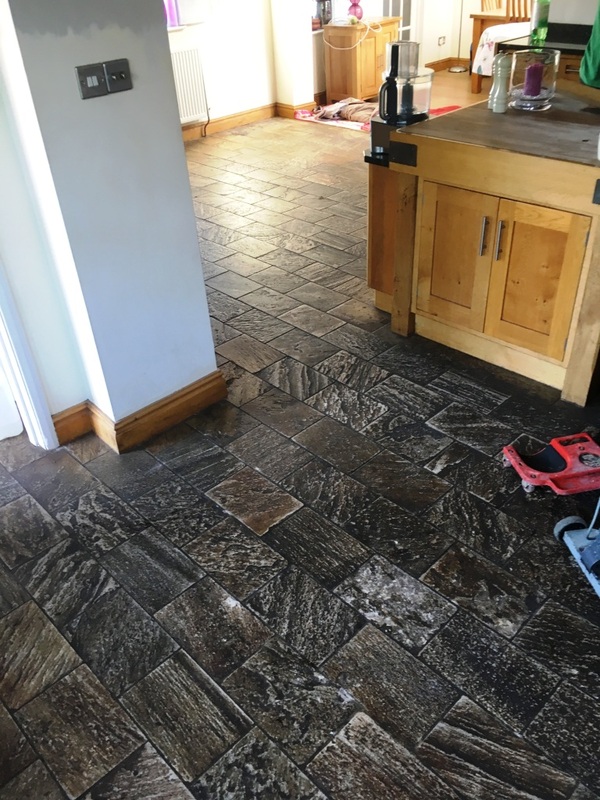 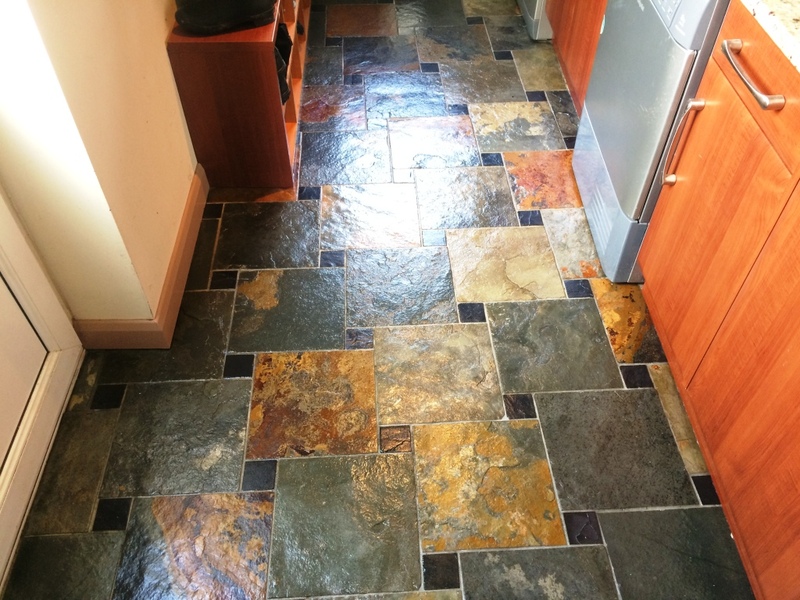 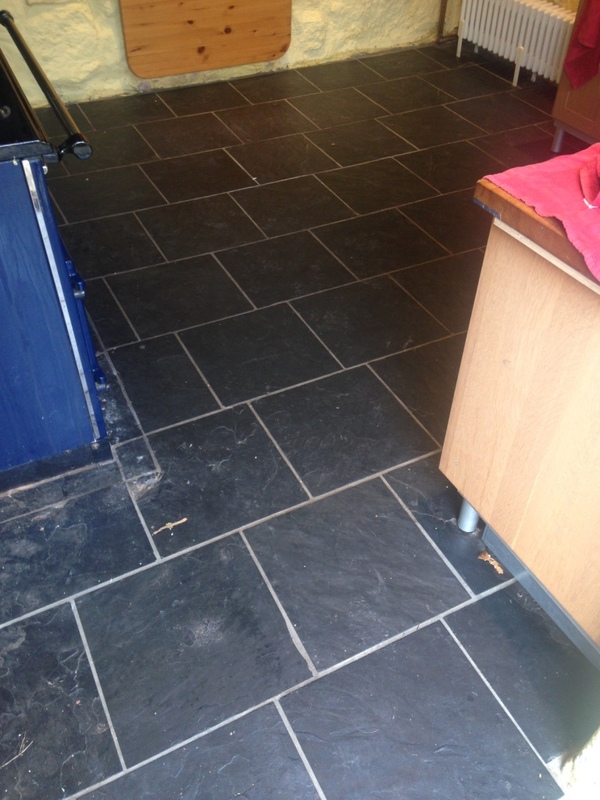 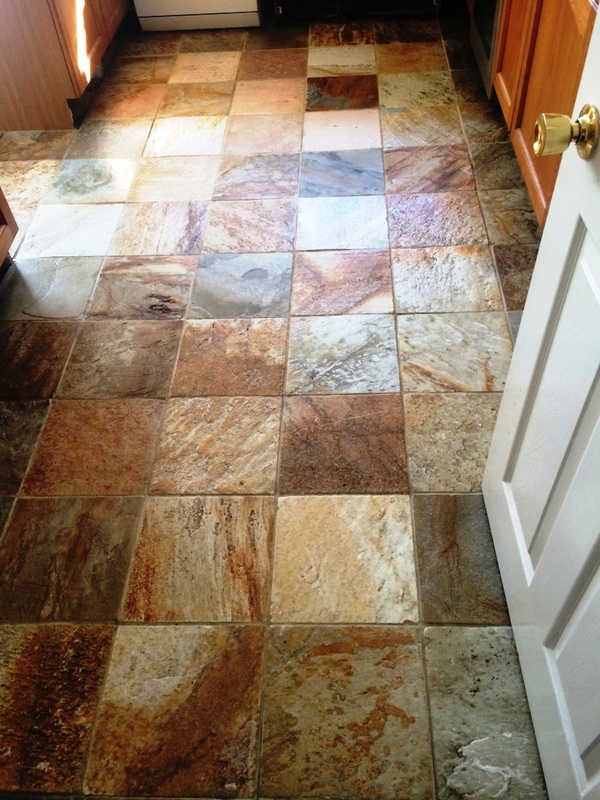 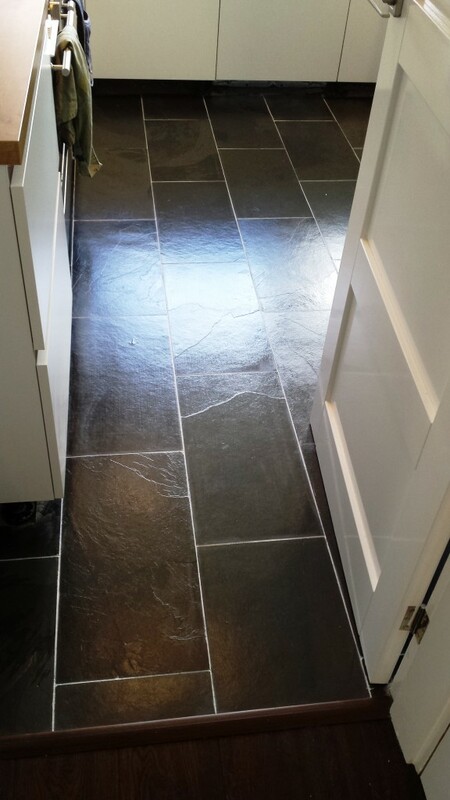 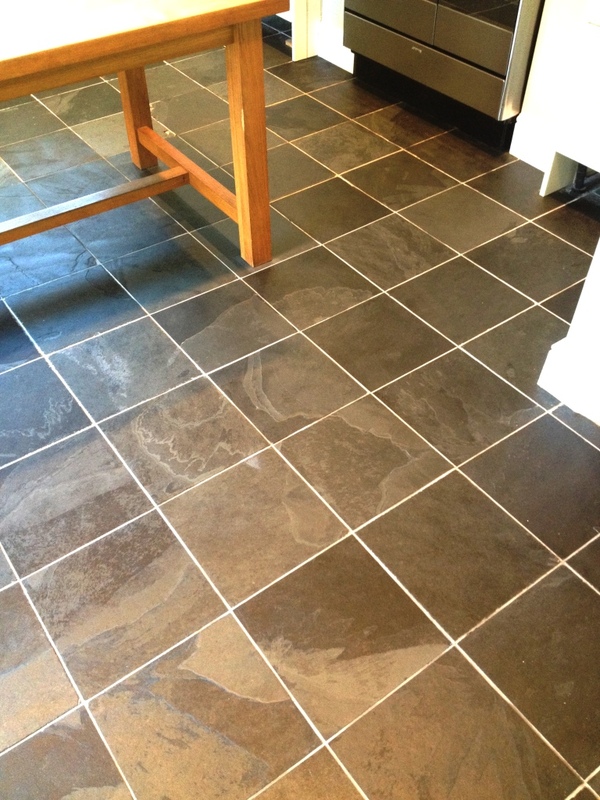 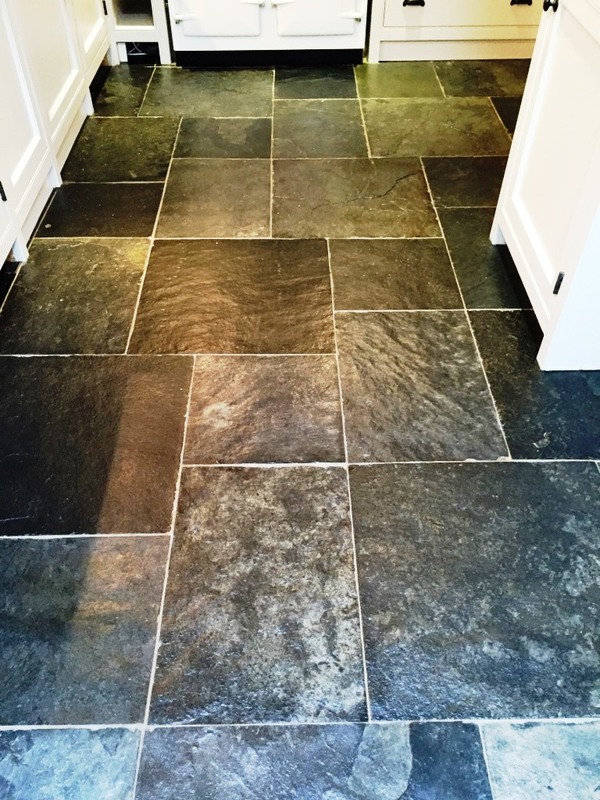 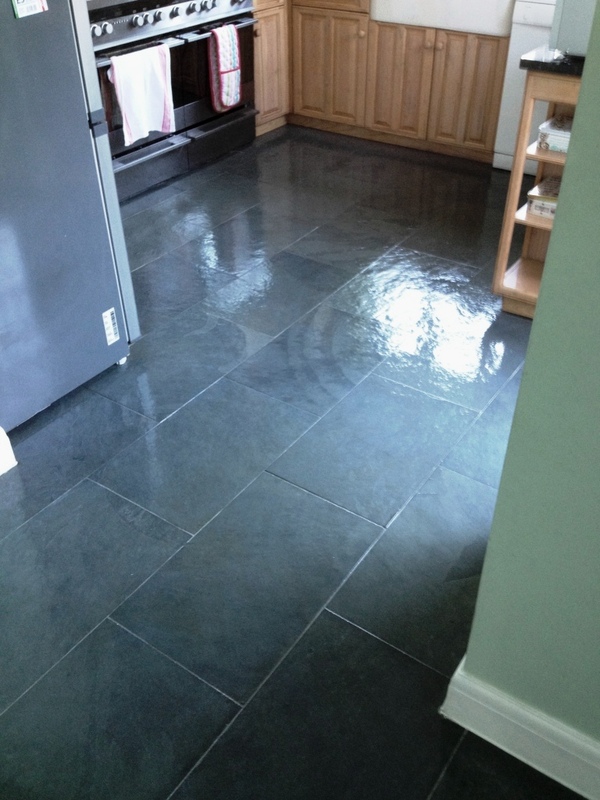 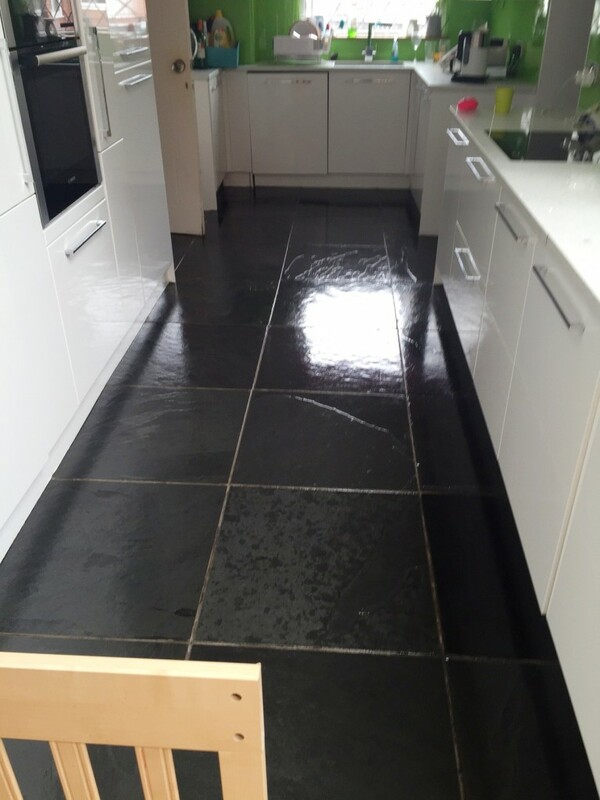 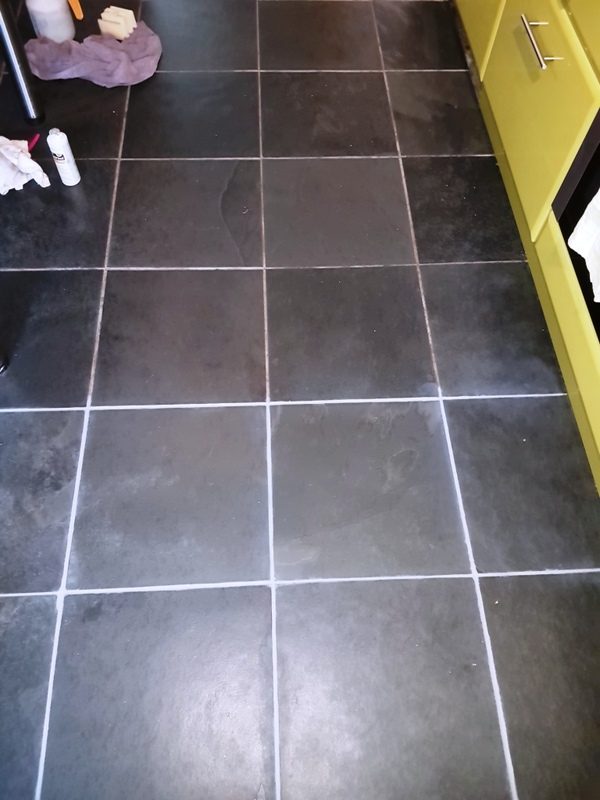 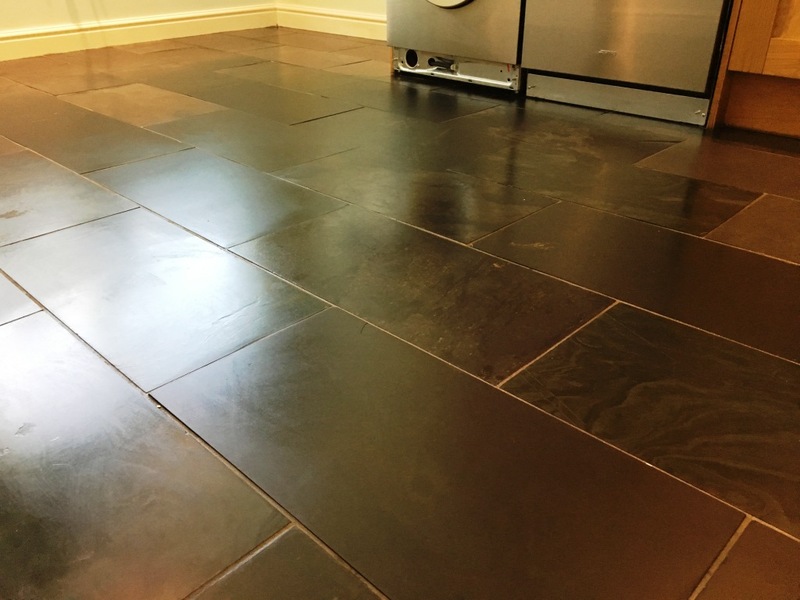 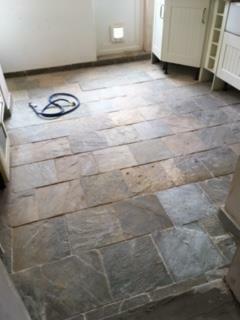 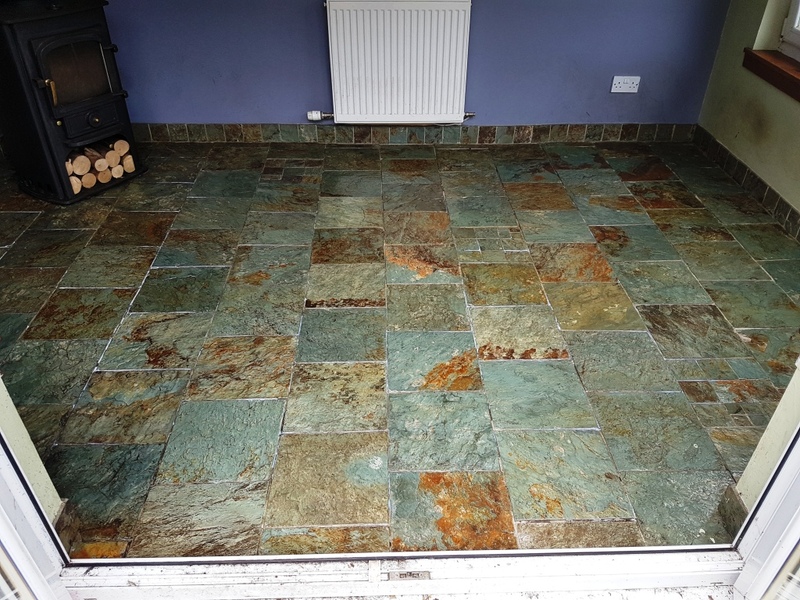 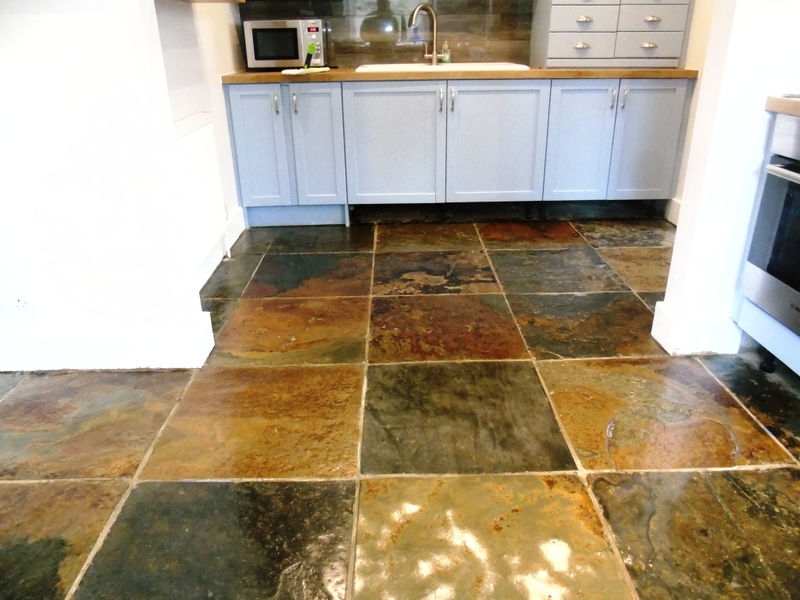 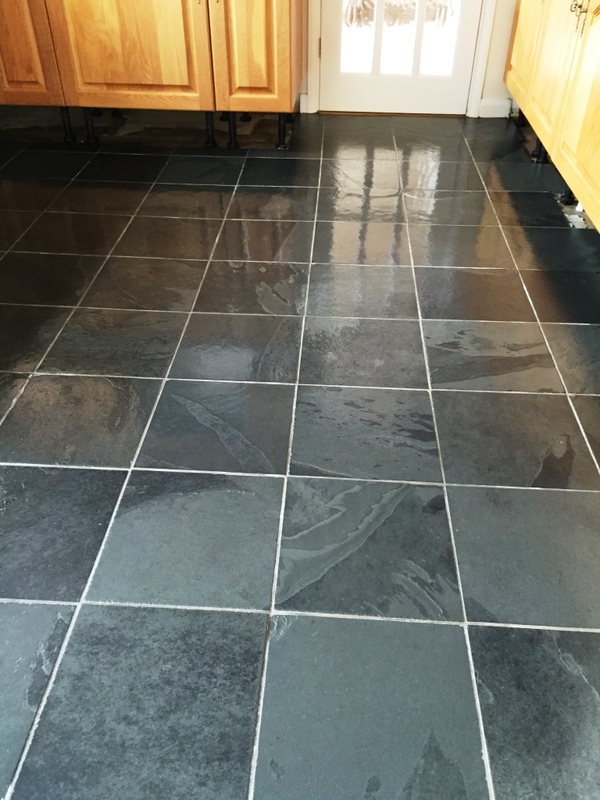 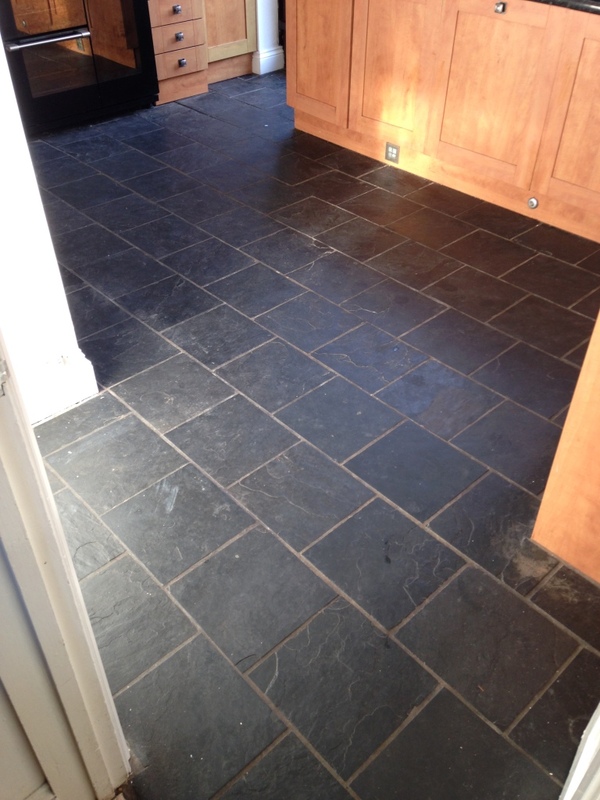 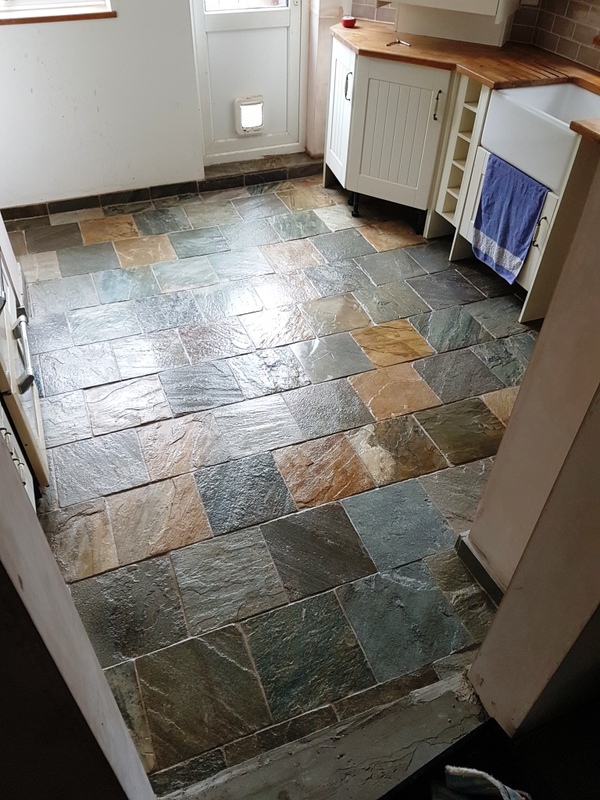 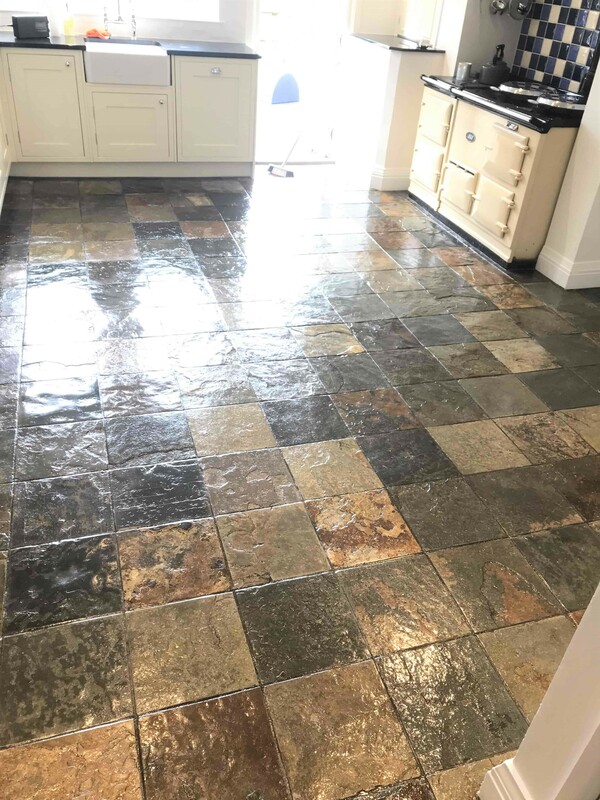 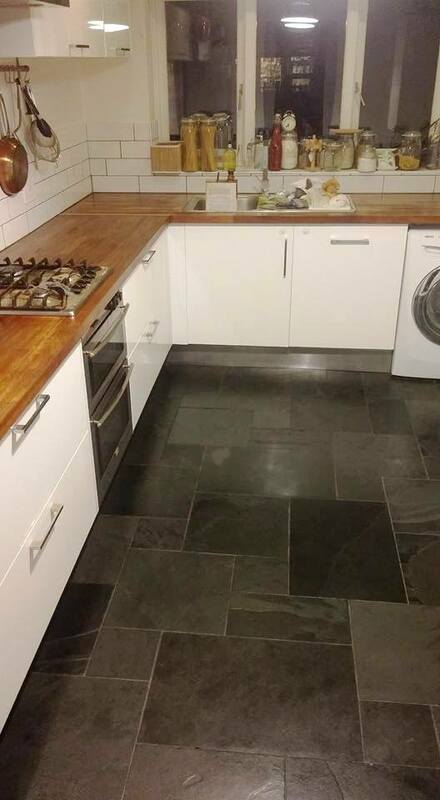 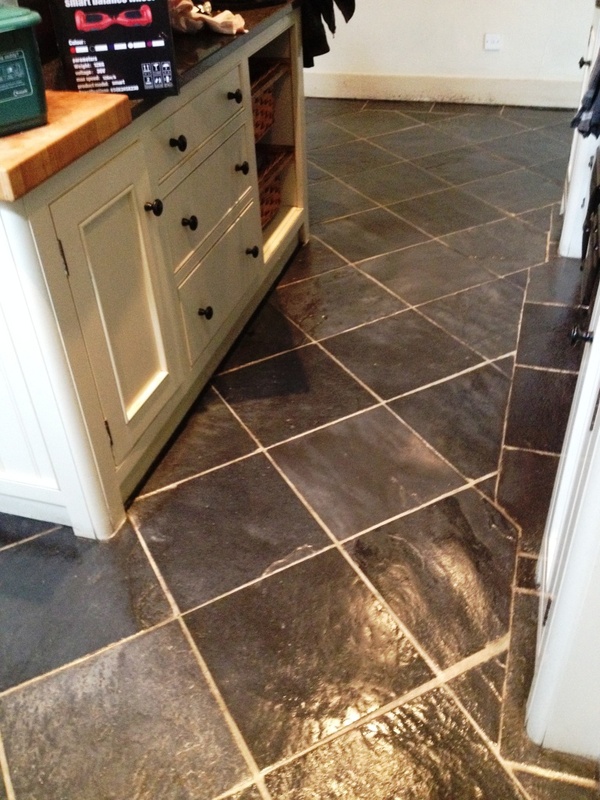 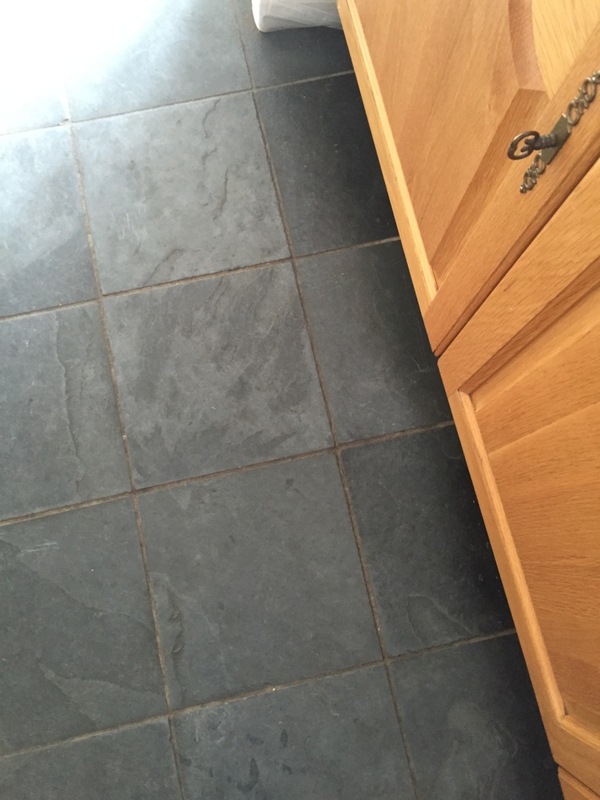 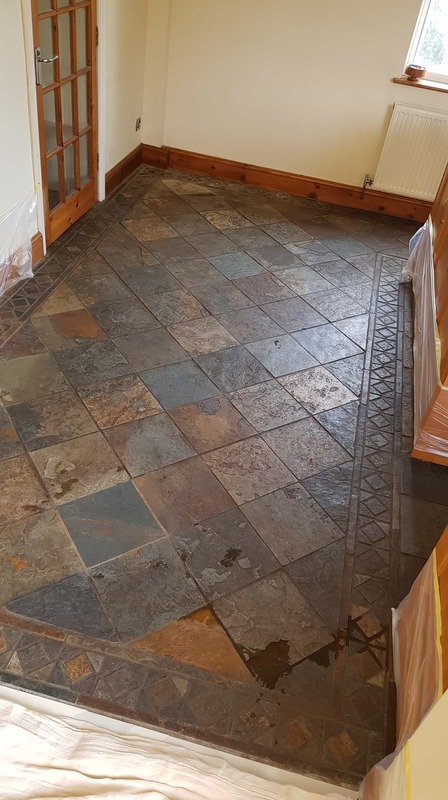 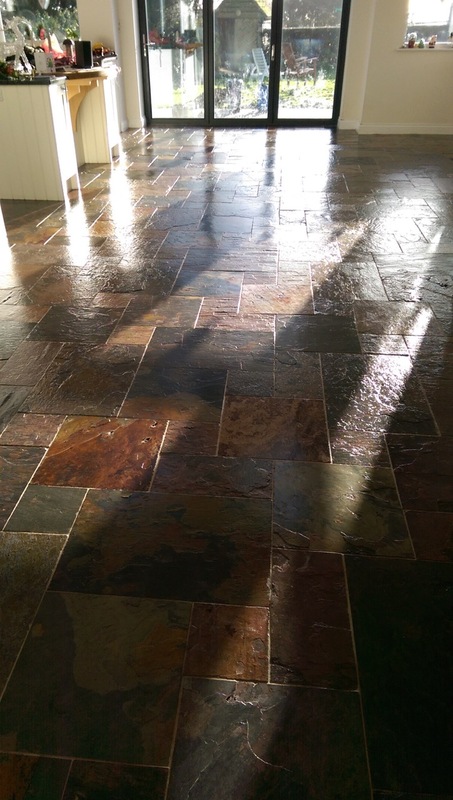 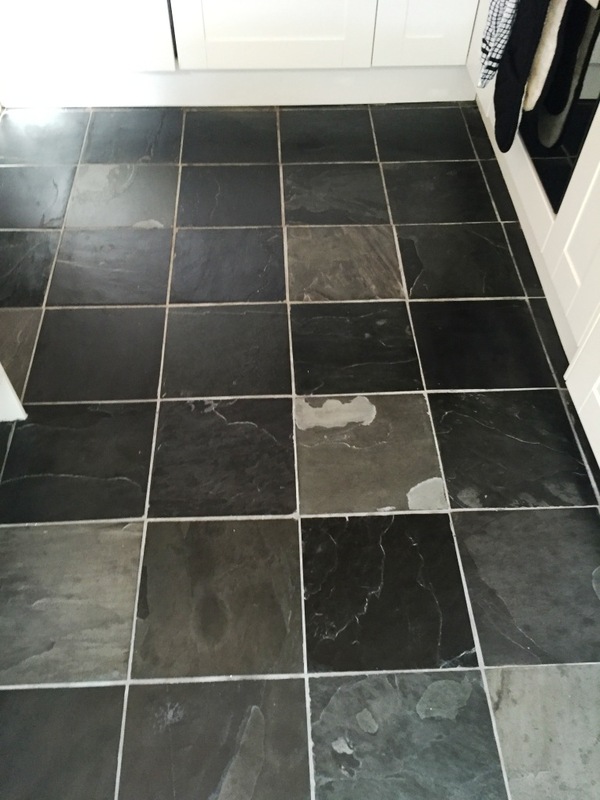 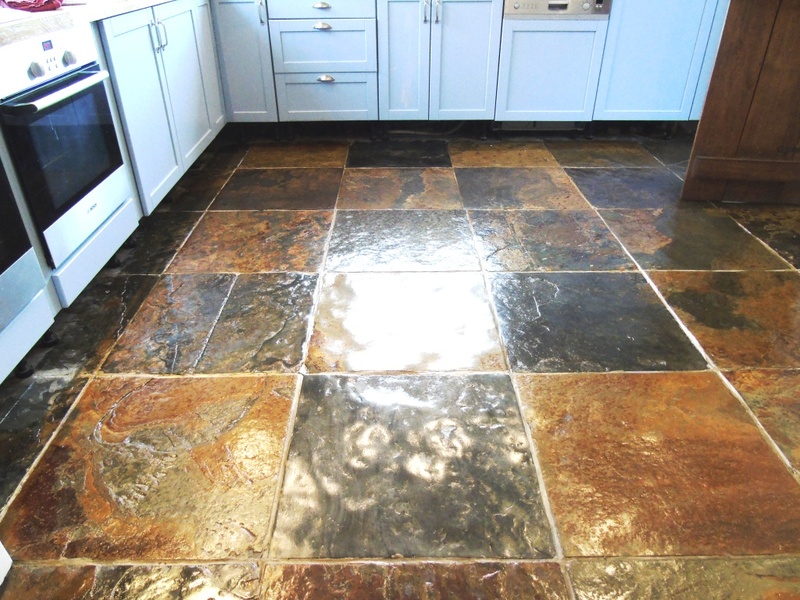 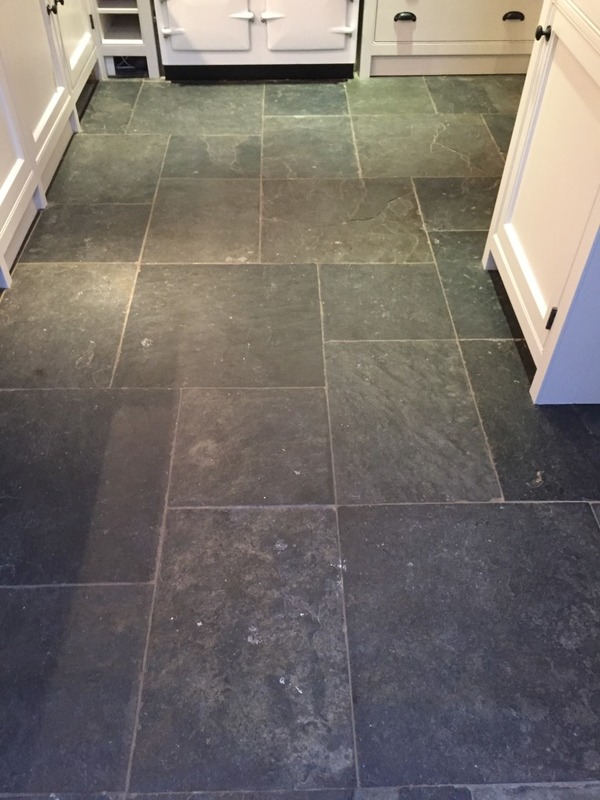 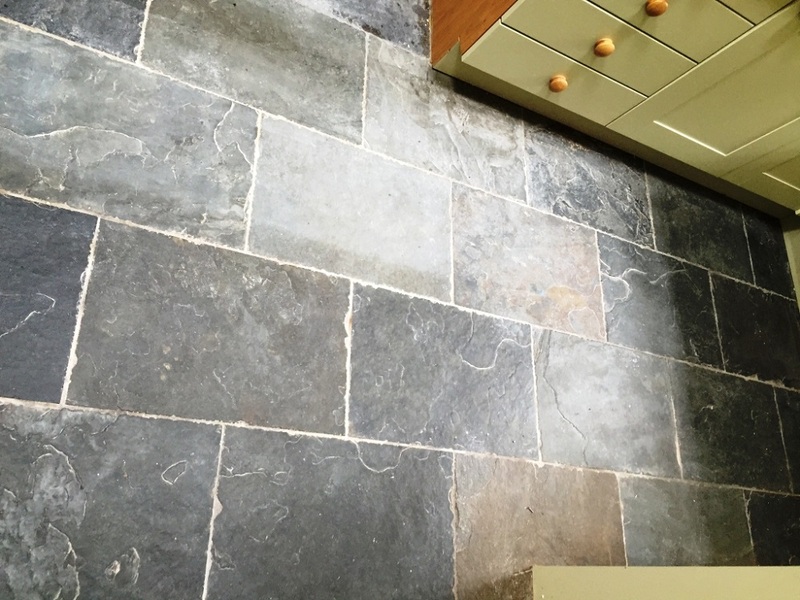 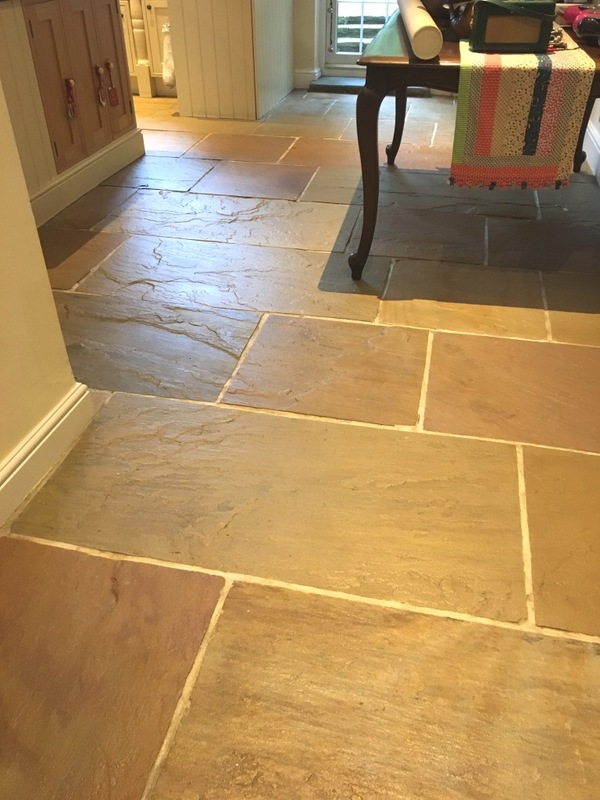 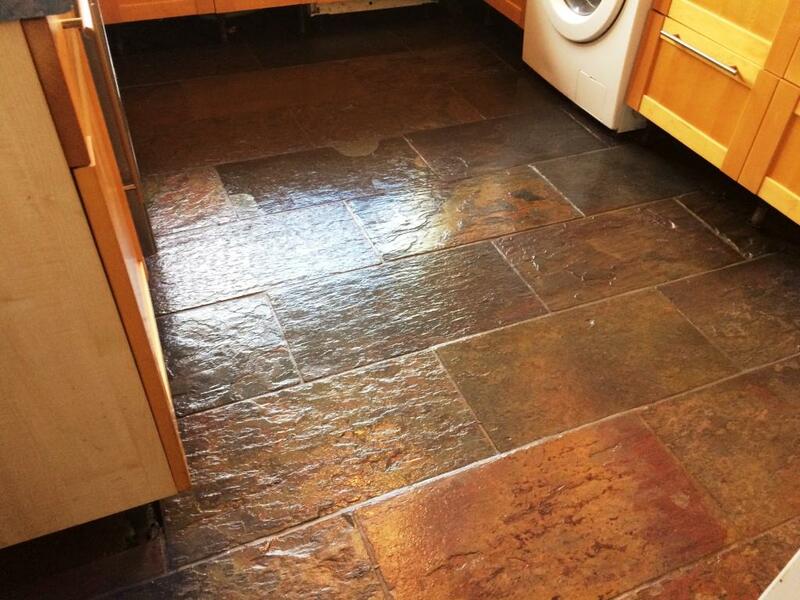 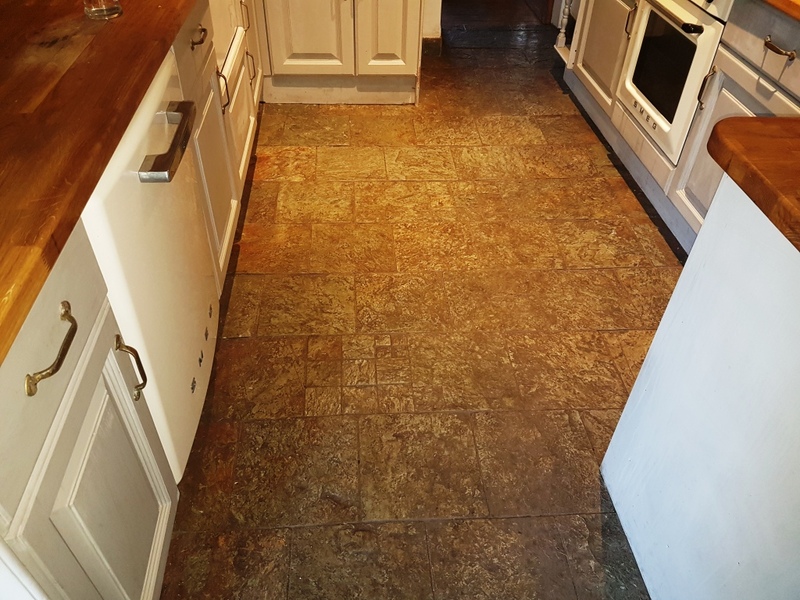 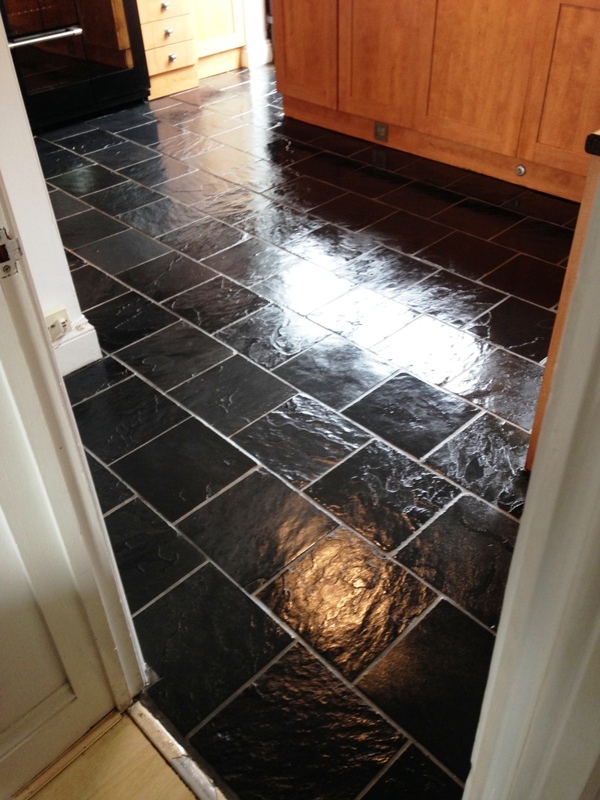 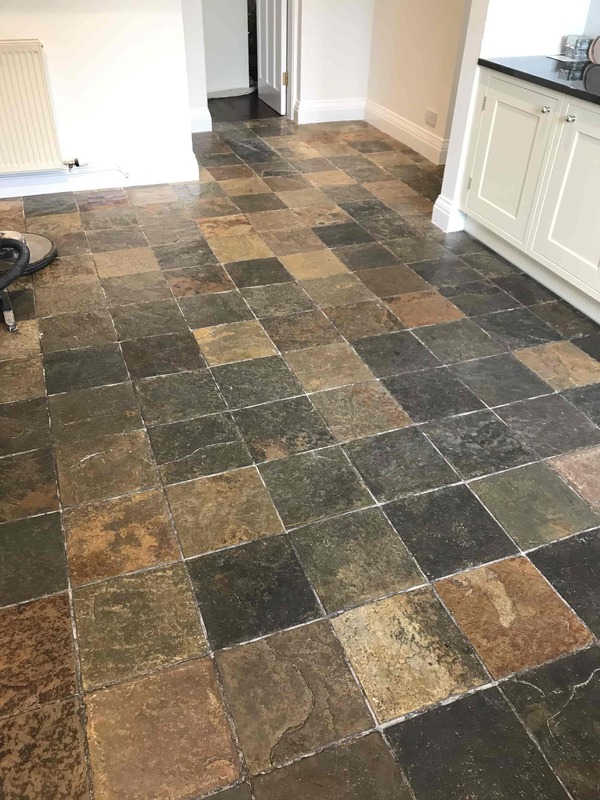 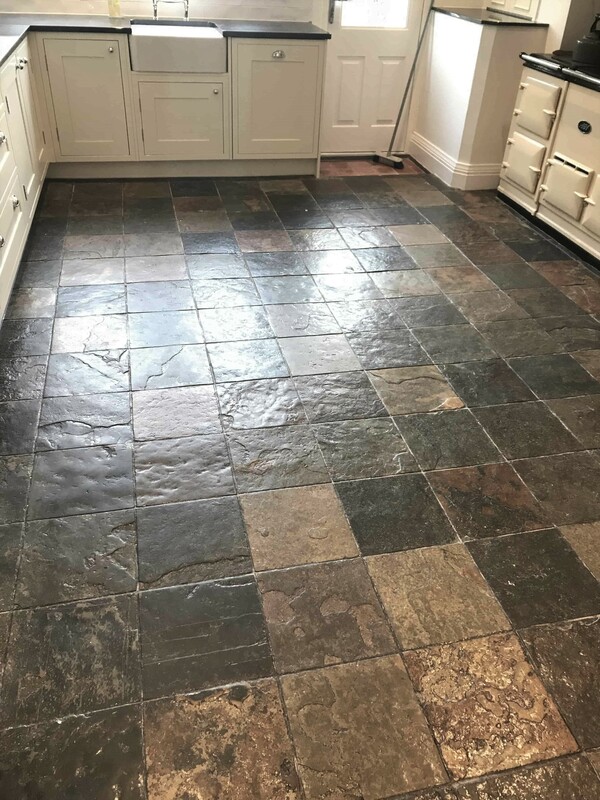 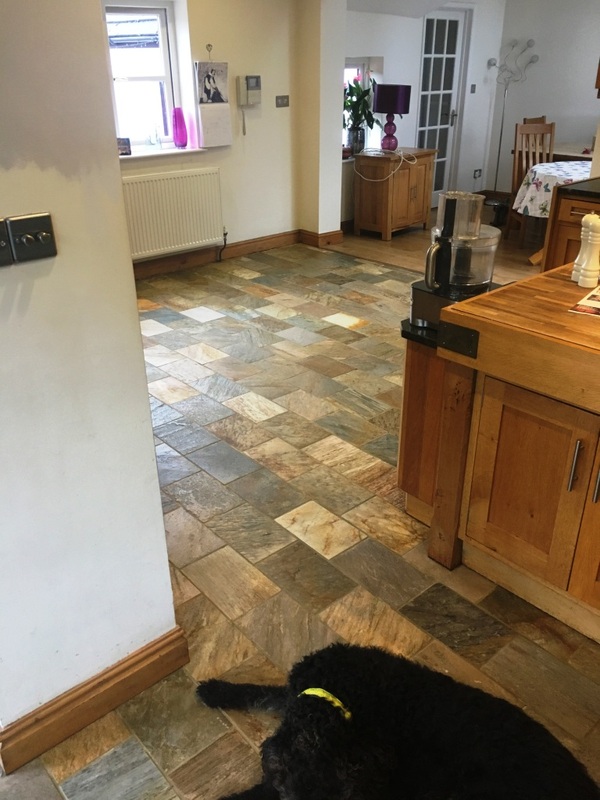 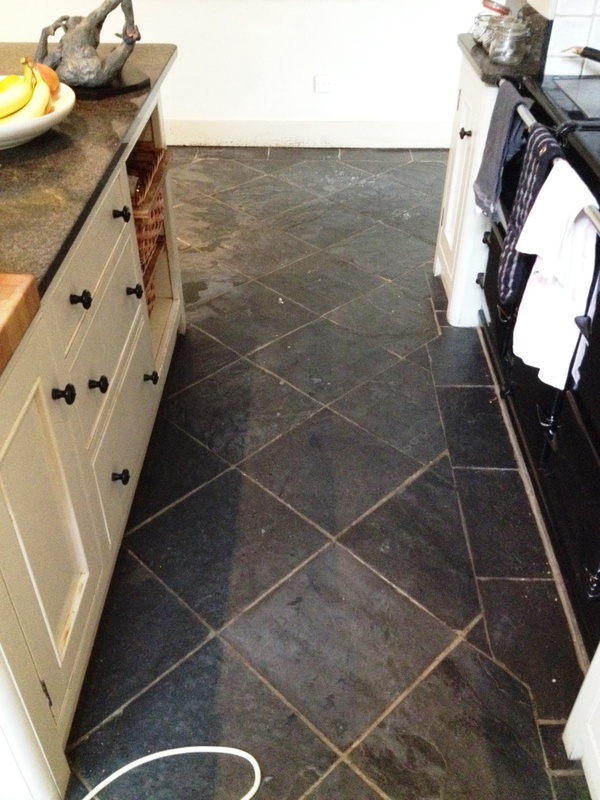 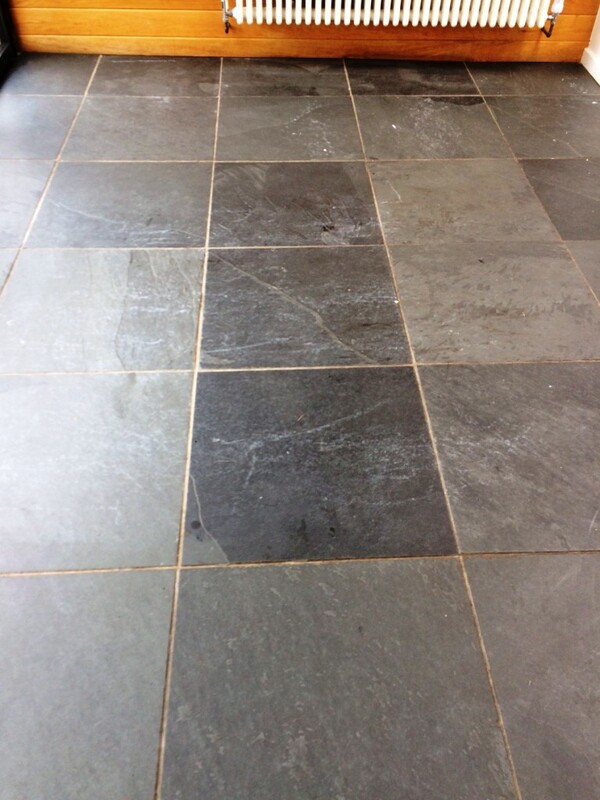 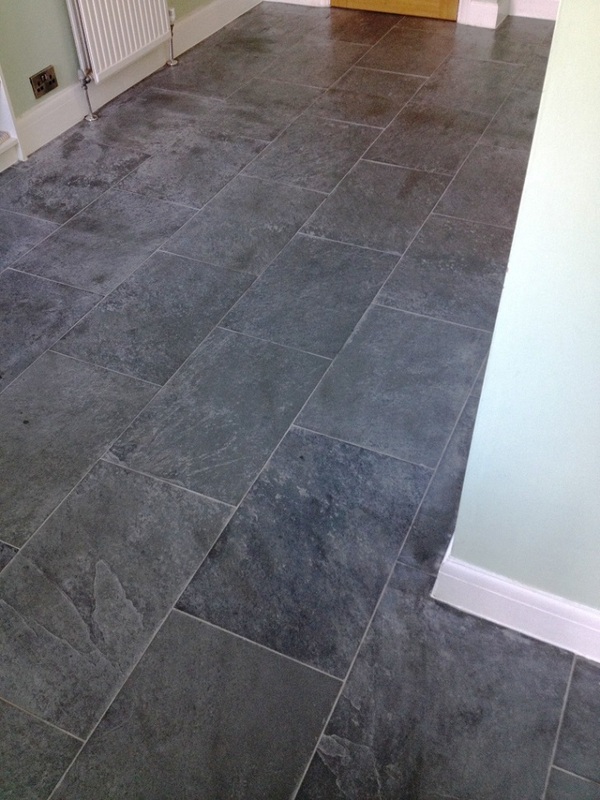 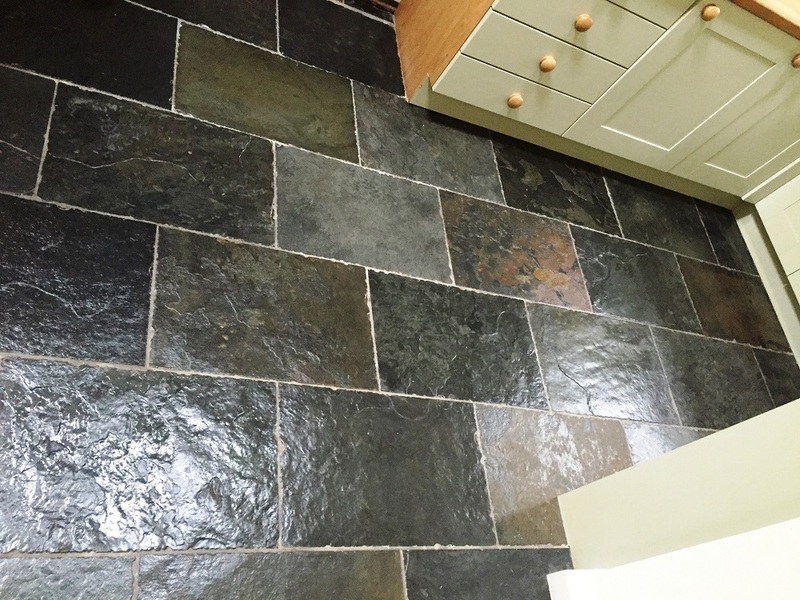 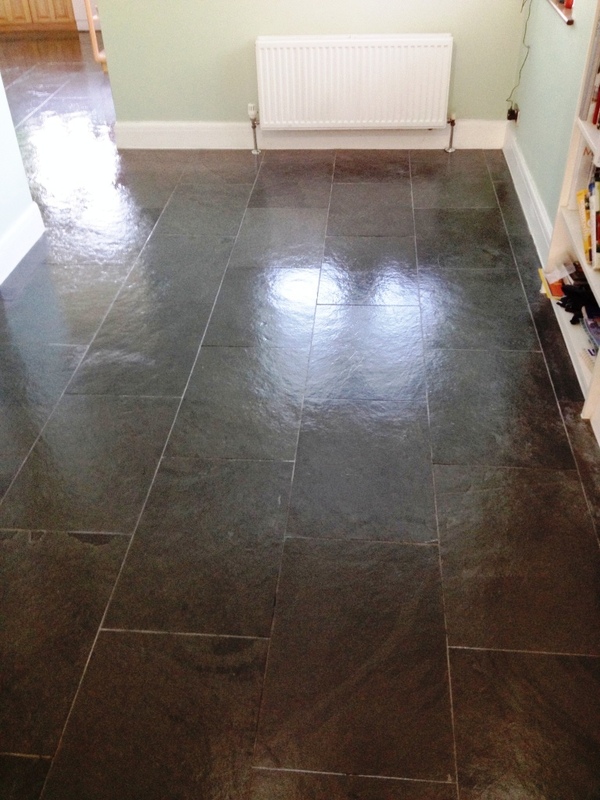 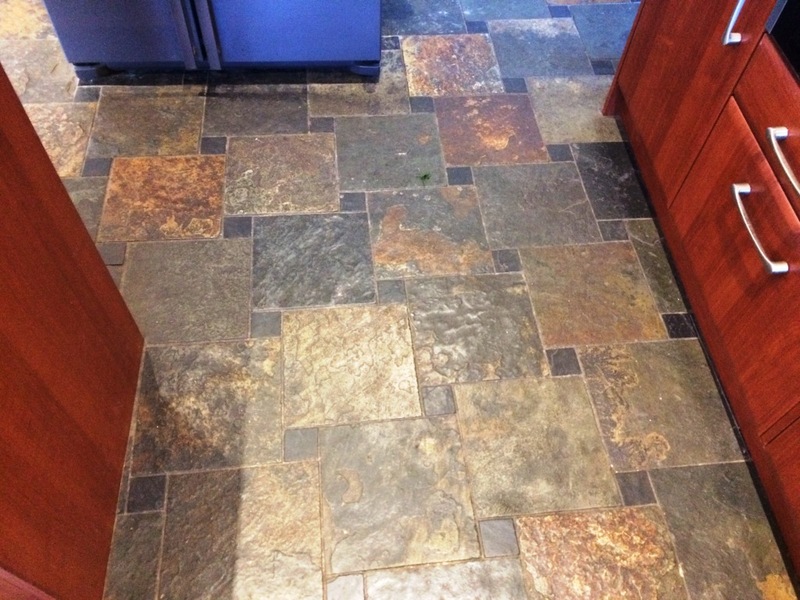 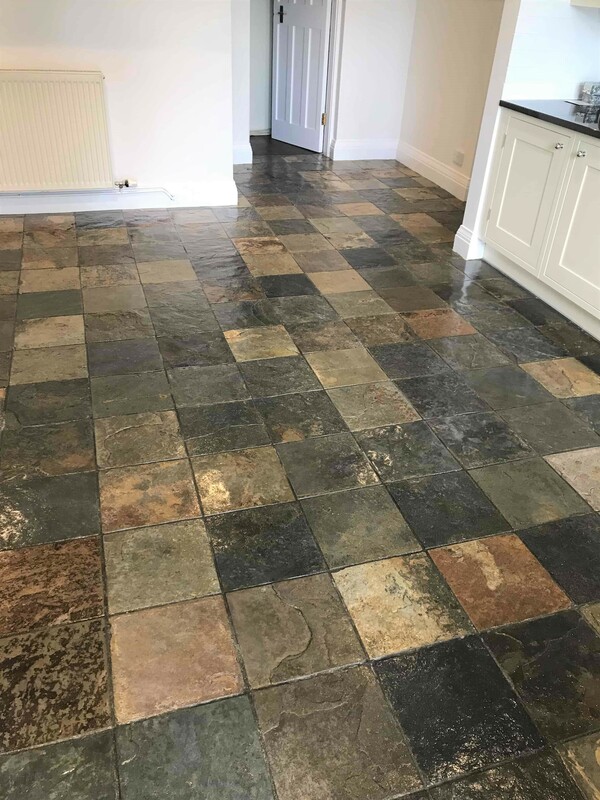 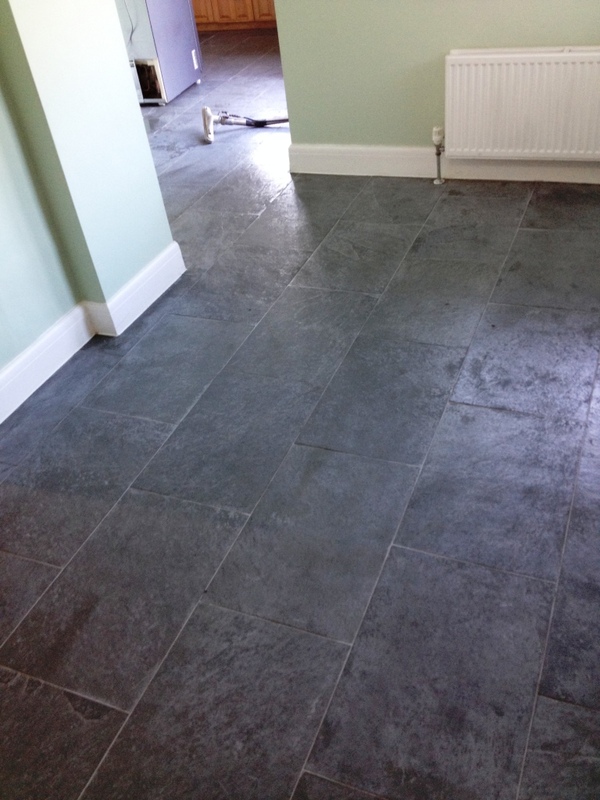 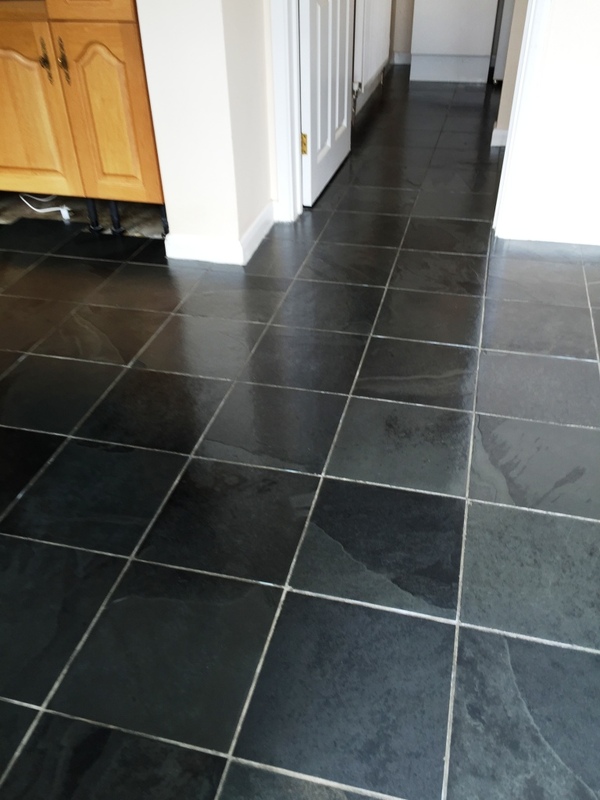 This example of an African Slate tiled floor was installed in the kitchen of a property in Mickleton, Gloucestershire, a town which is best known for its tradition of vegetable gardening. 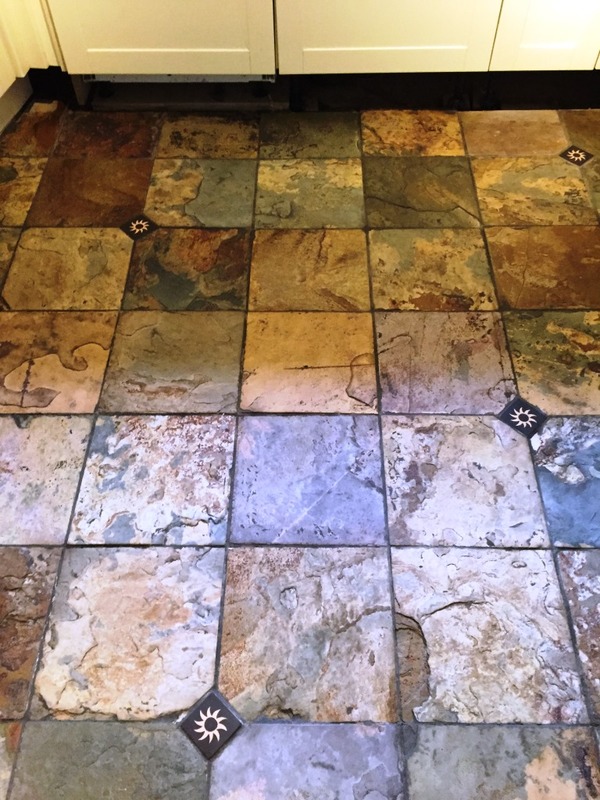 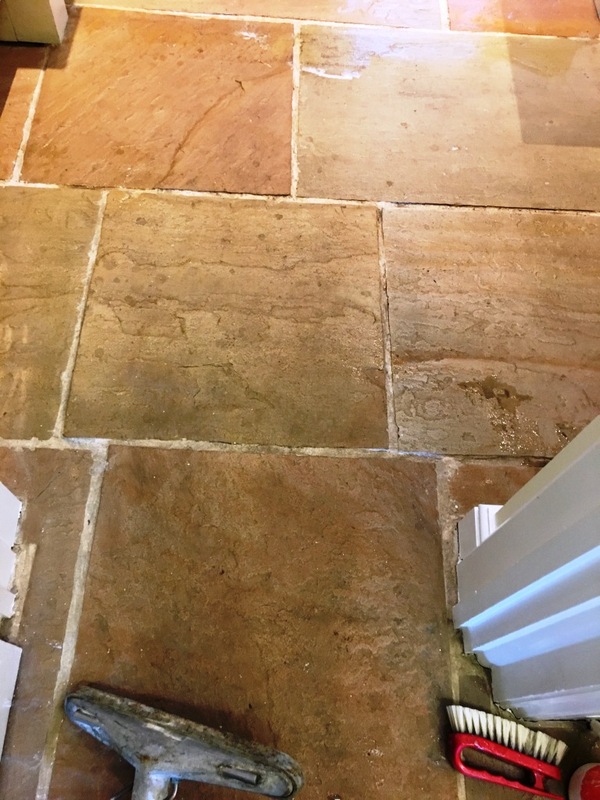 The floor was laid 15 years ago, but the owner had not maintained the sealer which would have protected the porous stone from dirt becoming ingrained. 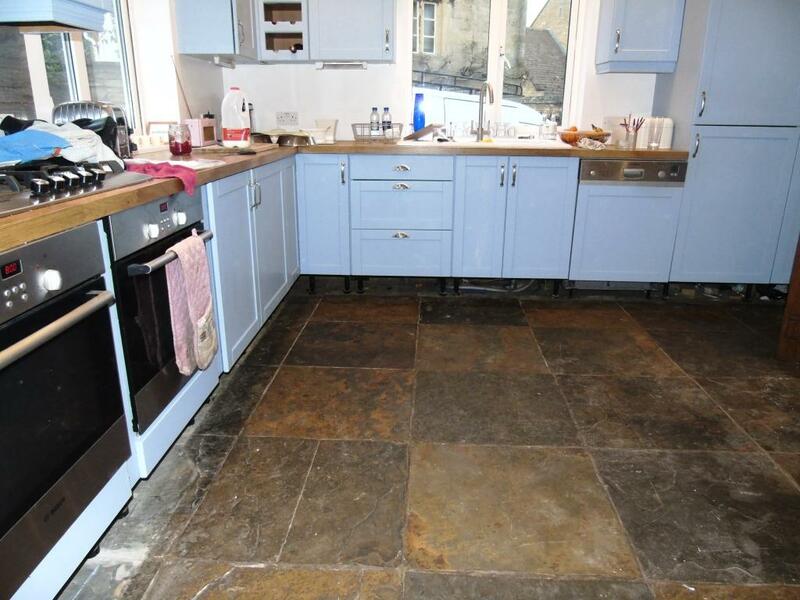 As a result, the floor was now in poor condition with the rich dark tones in the stone now dull, dirty and unremarkable. 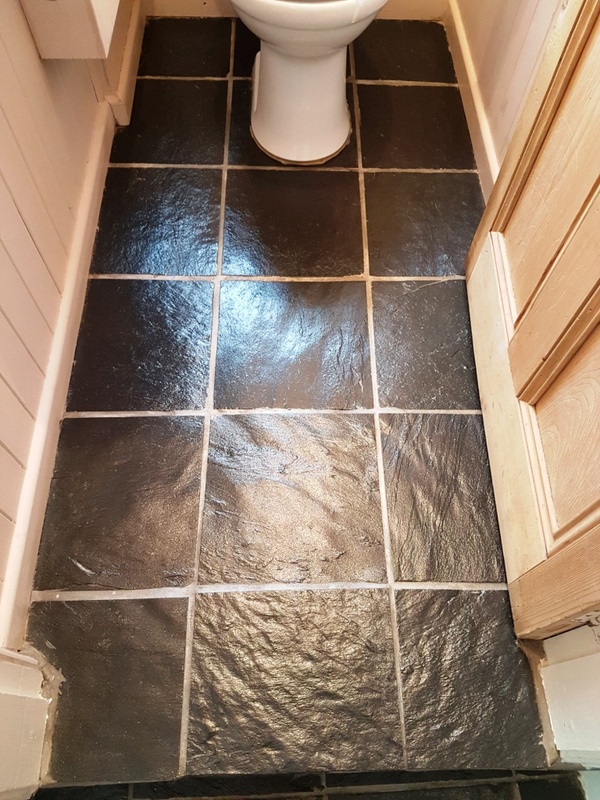 The owner had decided it was time to put it right so I was called in to make sure the tiles were restored to their original magnificence. 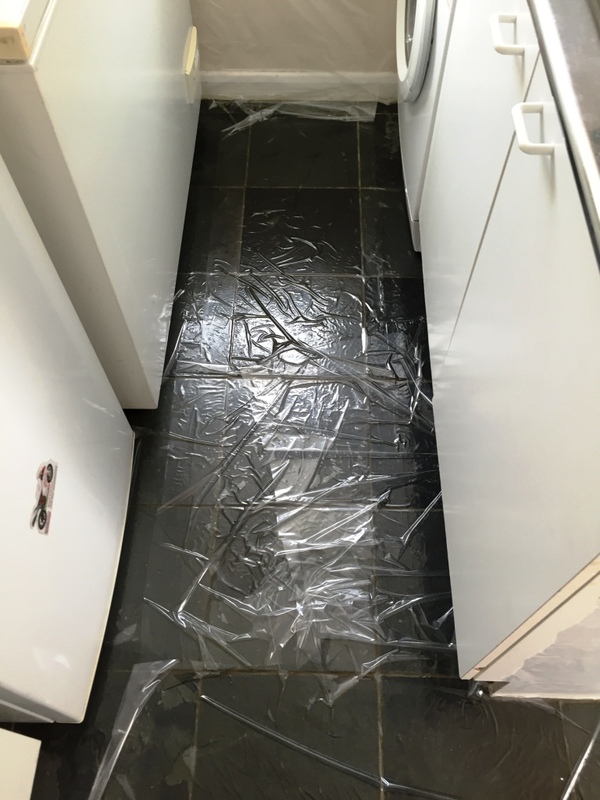 My first job was to unclip the kickboards from the base of the kitchen units, and then also cover the units themselves with plastic to guard them against potential splashing from the cleaning process. 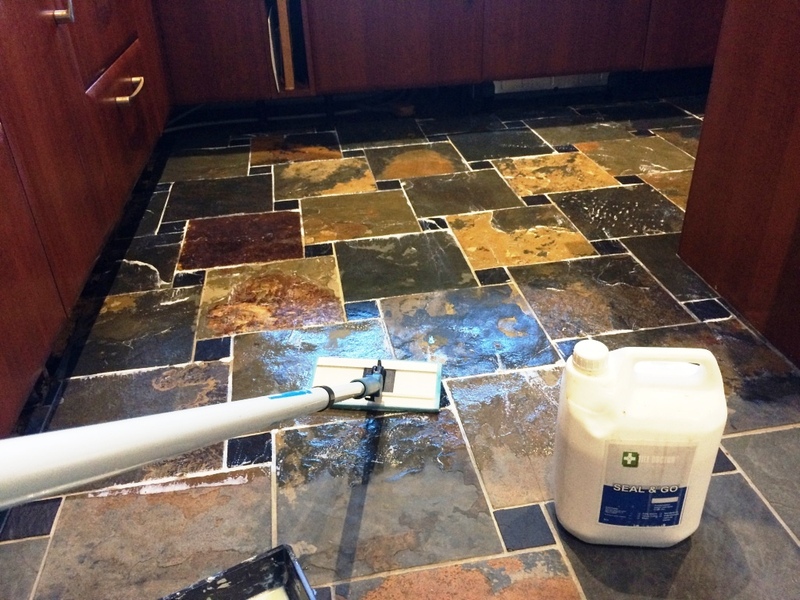 Next, to begin the process, I applied a solution of one part Tile Doctor Pro-Clean and three parts plain water. 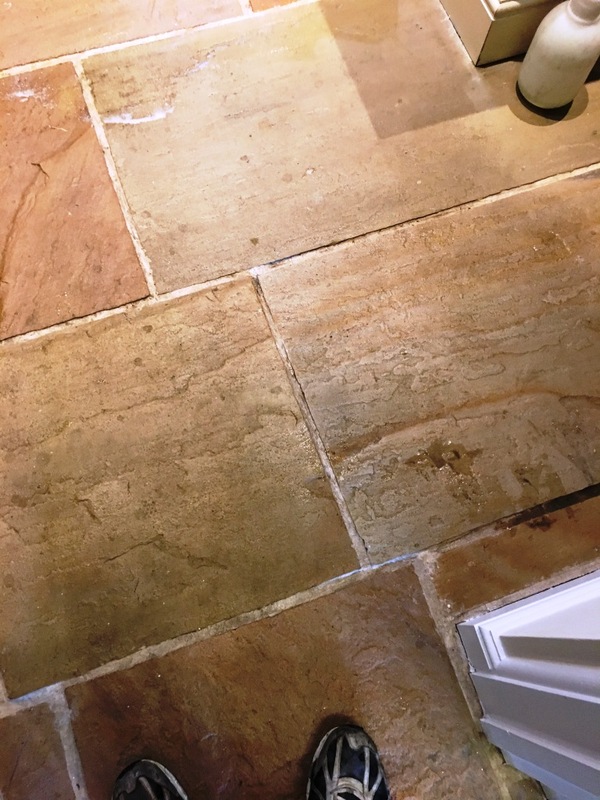 Pro Clean is a high alkaline cleaner which is so reliable when it comes to removing dirt that we use it on almost every job we do, from Slate and Quarry to Marble and Sandstone. 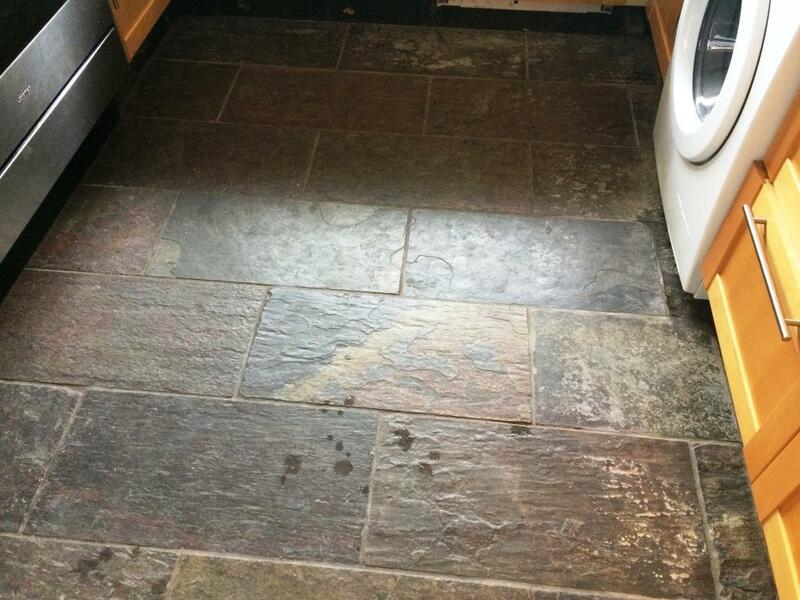 Once the product had been applied, I left it to soak into the stone for approximately fifteen minutes. 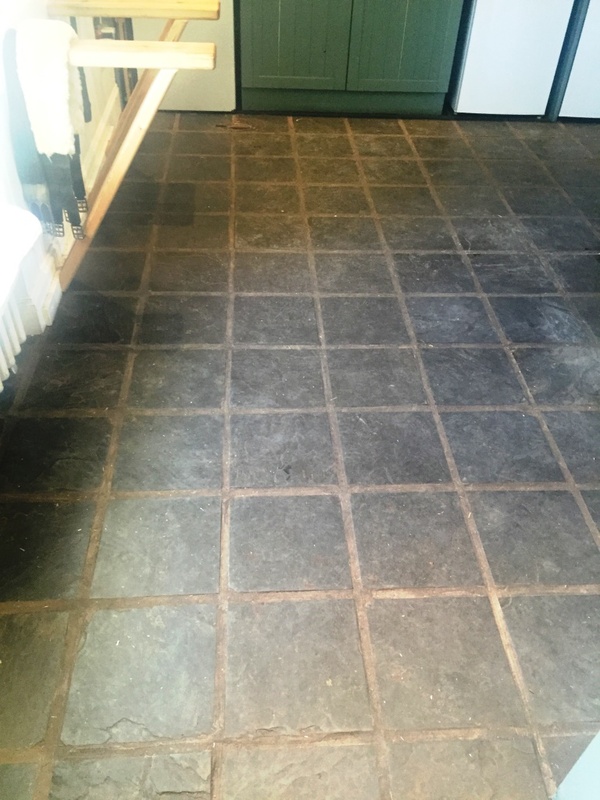 Then, using my buffing machine fitted with a 17 inch black scrubbing pad, I scrubbed the solution into the stone to clean the floor, releasing the ingrained dirt and removing the stains in the process. 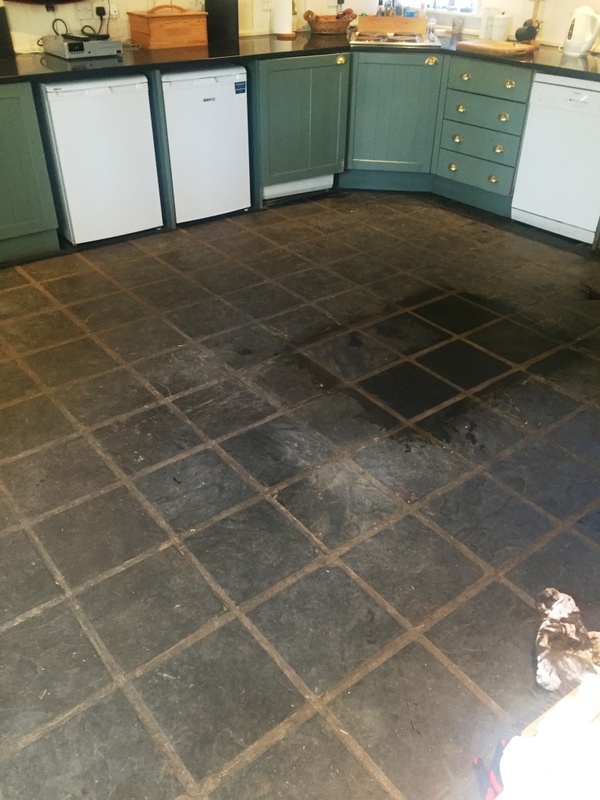 All the subsequent cleaning slurry was vacuumed up with a wet vacuum and I rinsed the floor with plain water. 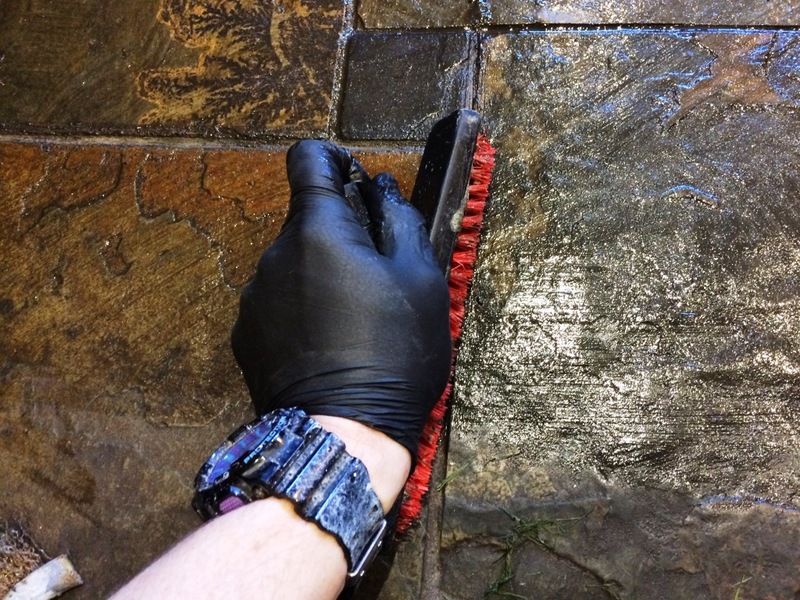 I repeated this process a couple of times to ensure the most thorough clean possible. 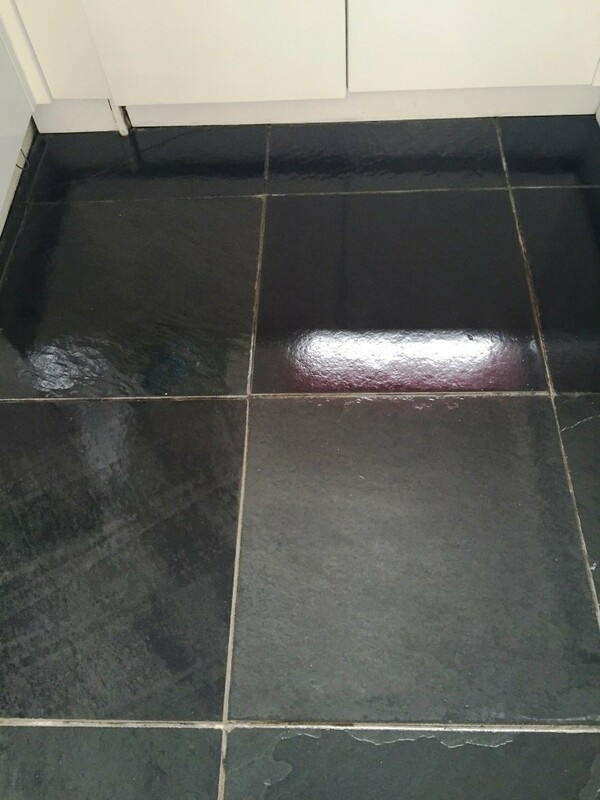 Then once satisfied with the condition of the tiles, I turned my attention to the cleaning all the dirty grout lines, again using Pro-Clean. 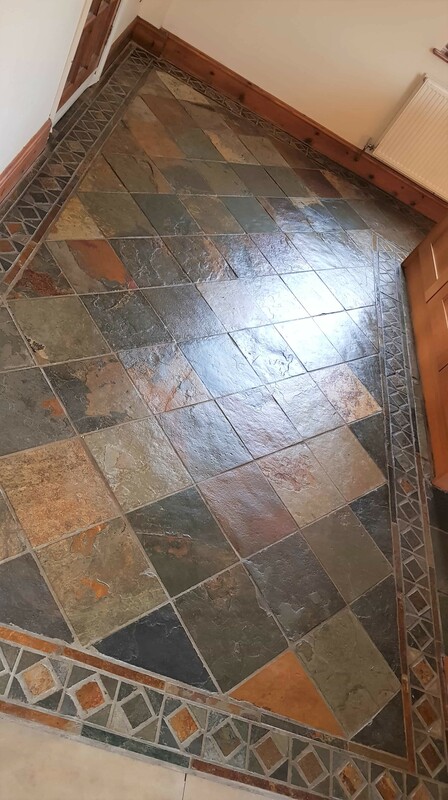 The main difference here was that I scrubbed the product in by hand using a special grout brush as opposed to using a buffing machine. 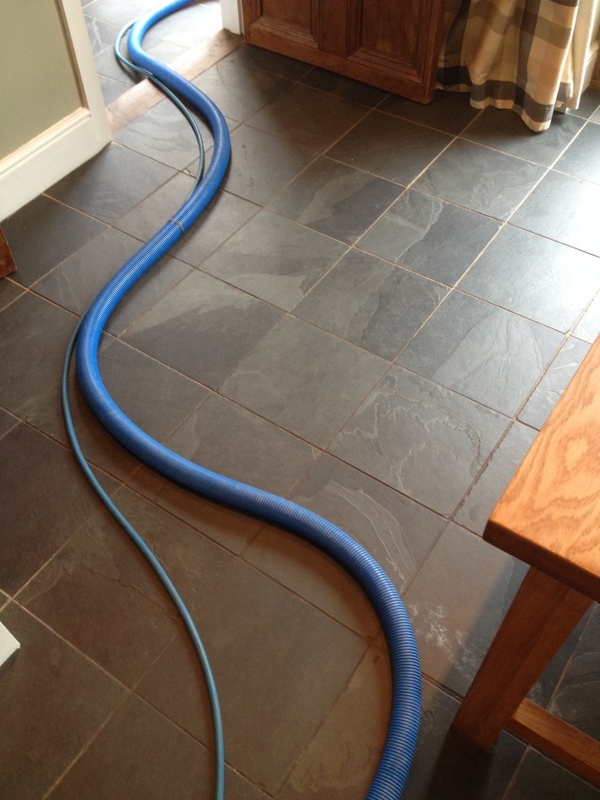 The rinsing and vacuuming process was then carried out once again. 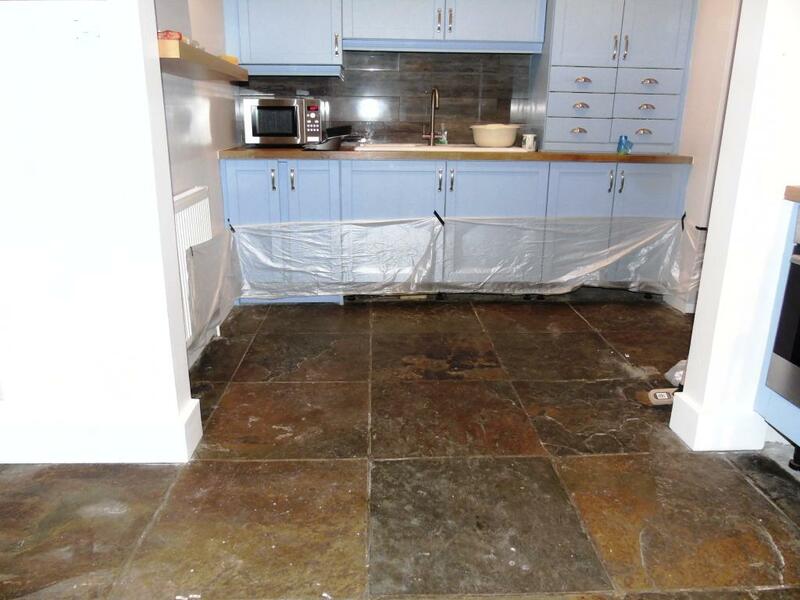 Once the cleaning process had been completed, I covered the floor with dust sheets and left it to dry off overnight. 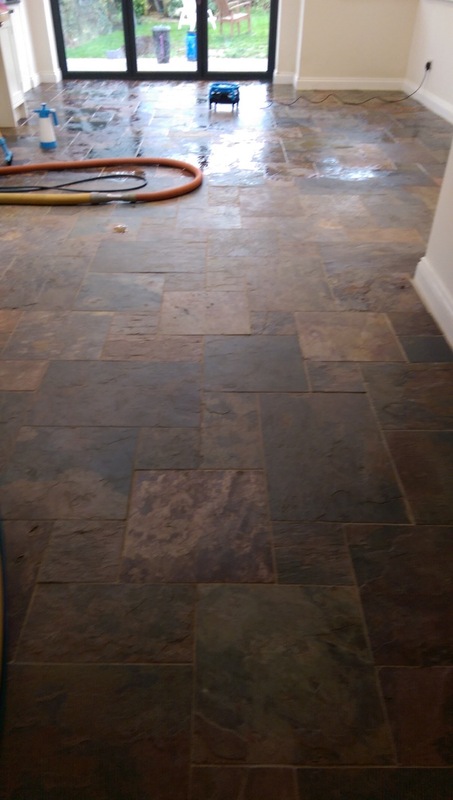 I returned to the property the next day to find the the floor dry and ready to be sealed. 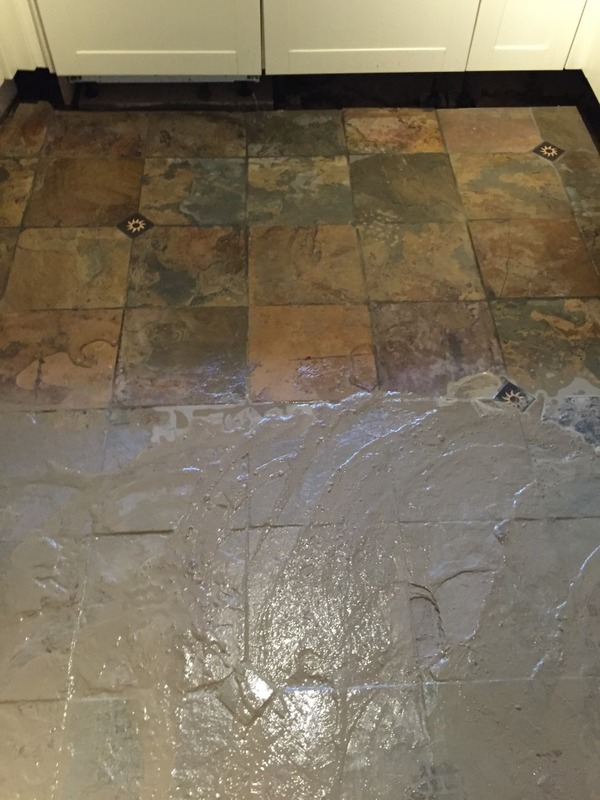 I proceeded to seal the tiles with four coats of Tile Doctor Seal and Go, leaving roughly 30 minutes between coats. 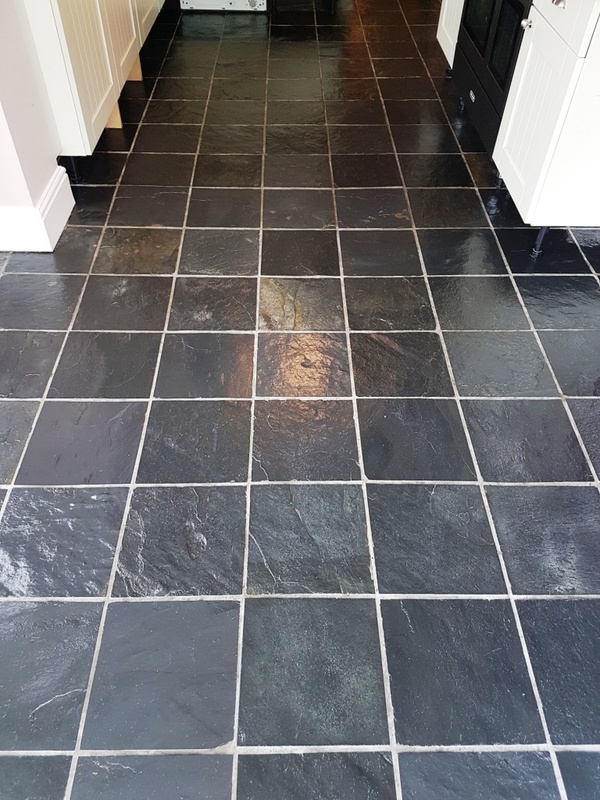 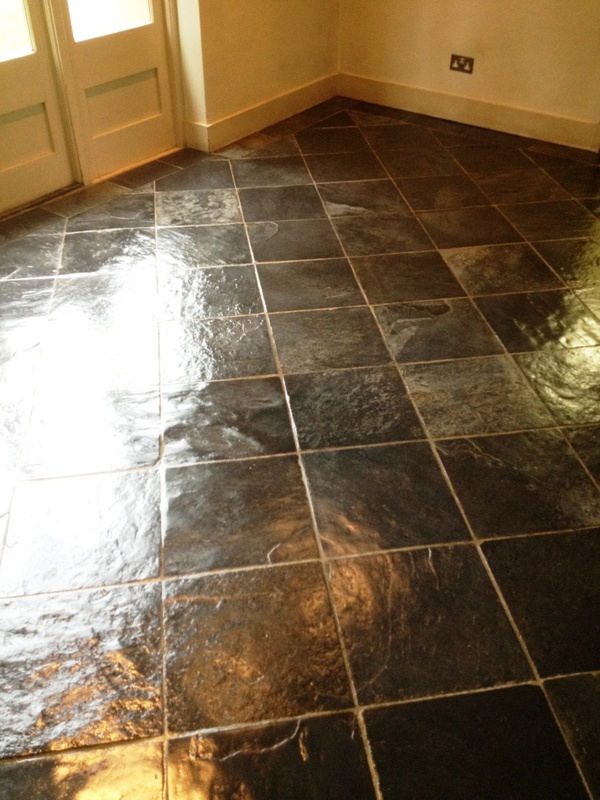 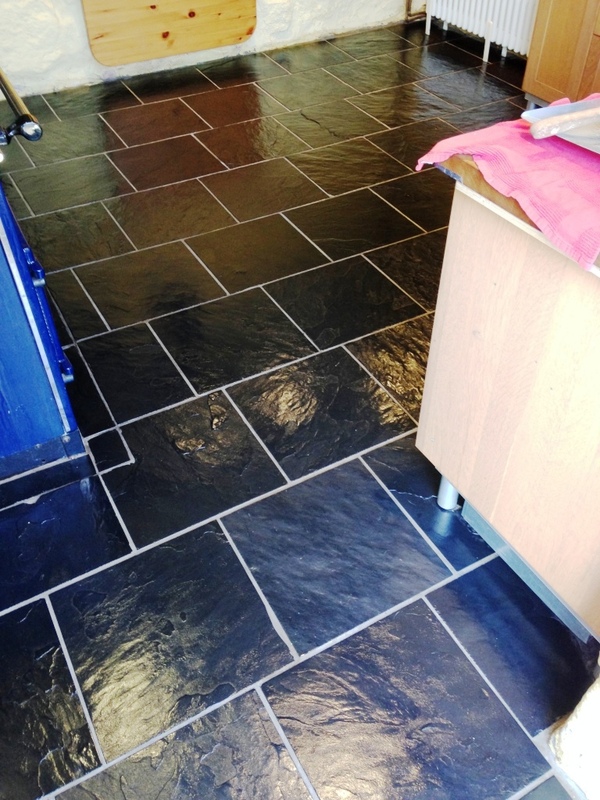 Seal and Go is a robust sealer that works really well on floors like these and results in a durable low sheen finish that really emphasises the natural characteristics of the African Slate. 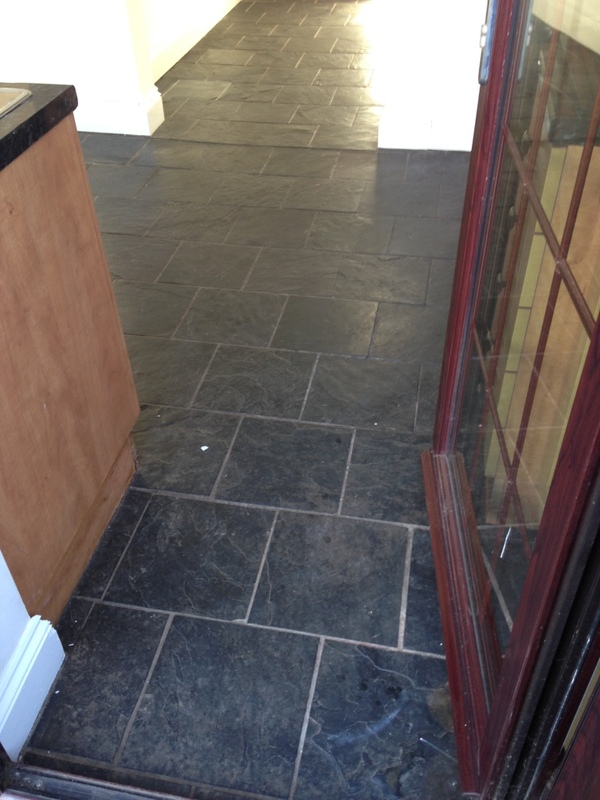 The customer was absolutely delighted with the restored appearance of the floor. 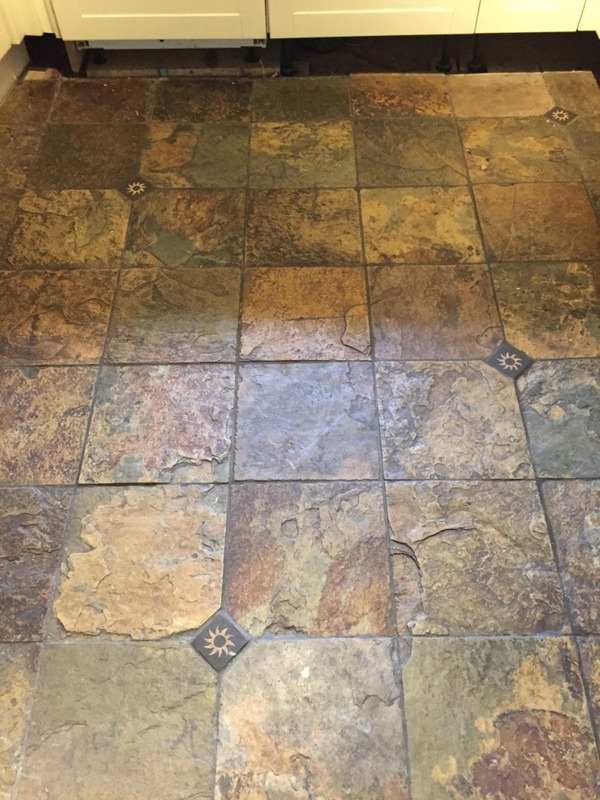 In fact, it reminded her of how it looked when it was first installed 15 years ago! 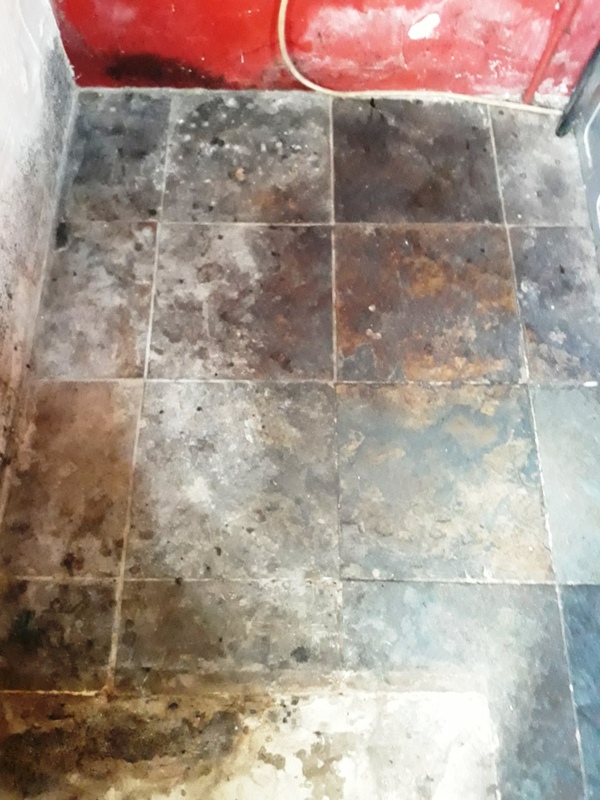 A complete transformation in just two days. 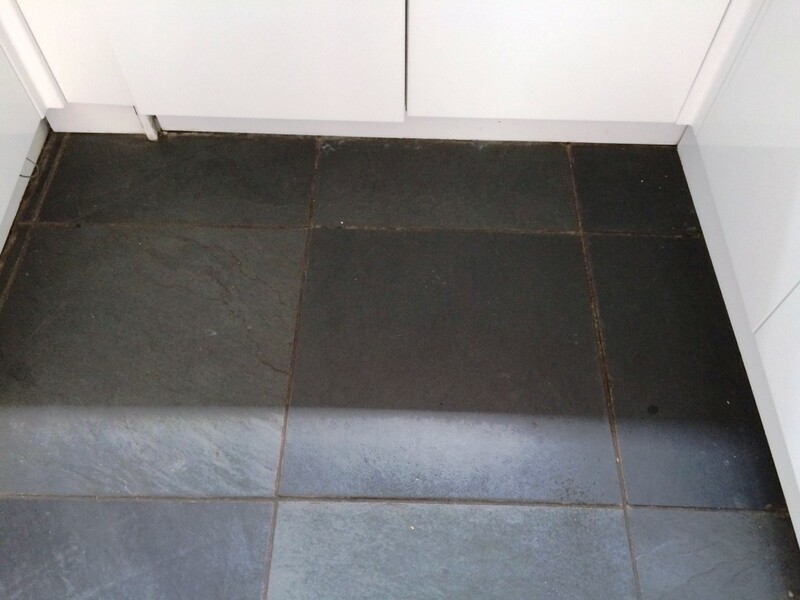 One of the worst examples of bad tiling practice is to leave a newly installed floor unsealed and therefore unprotected. 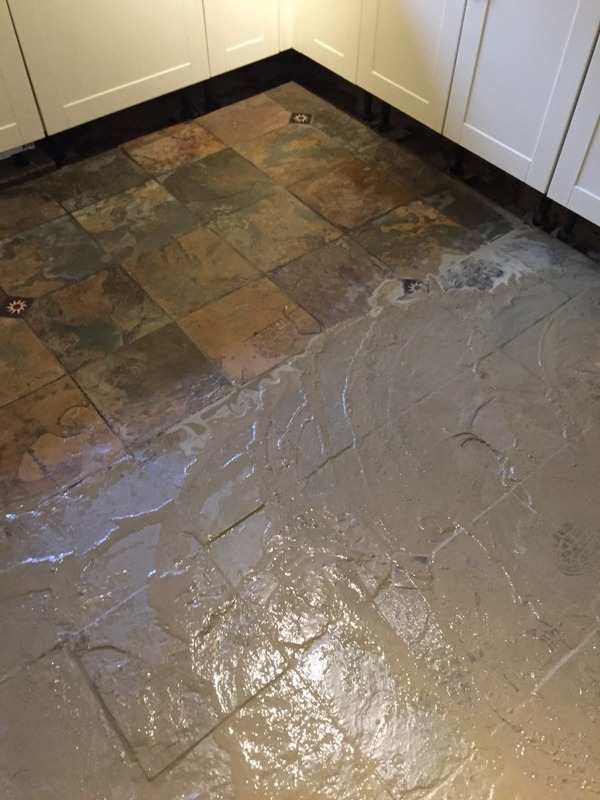 This is exactly the problem that had occurred at this property in Lymm, West Cheshire. 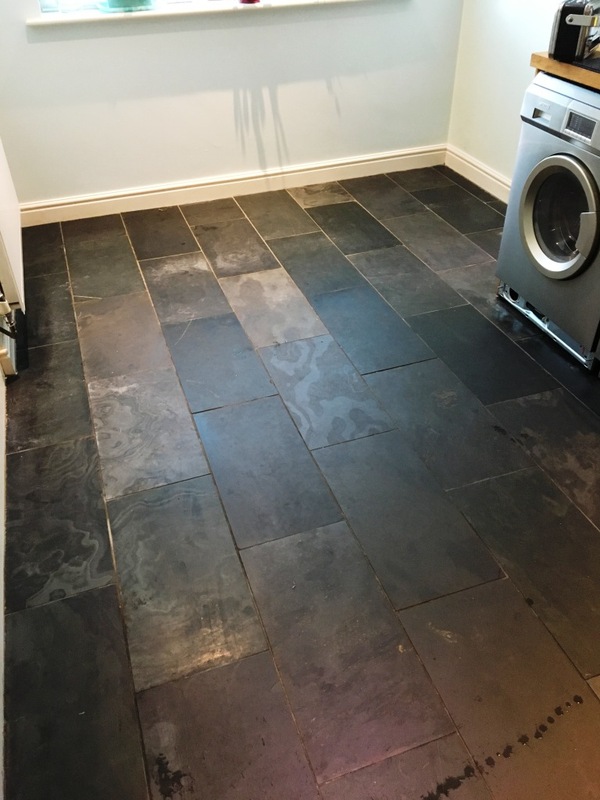 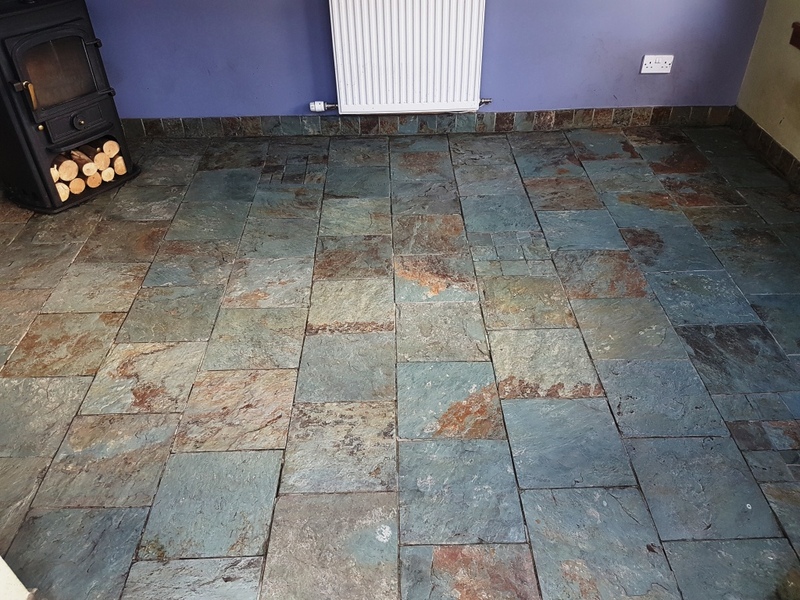 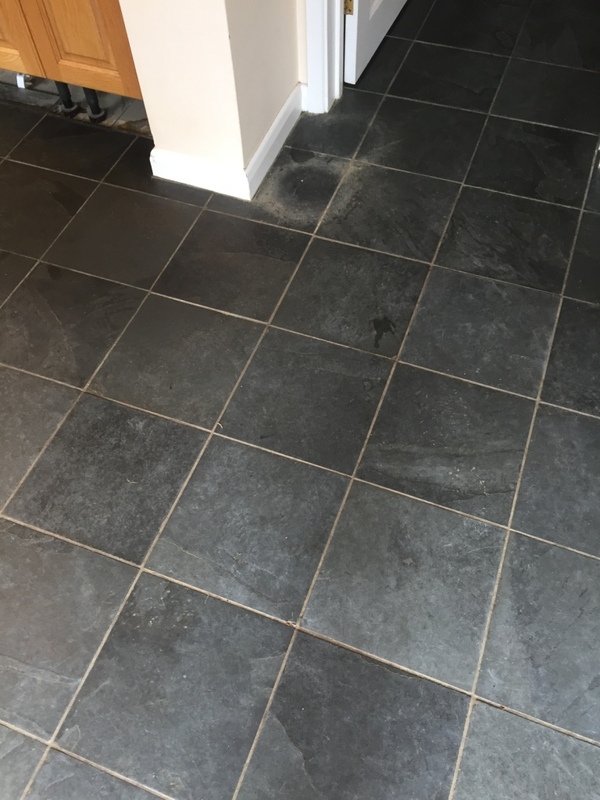 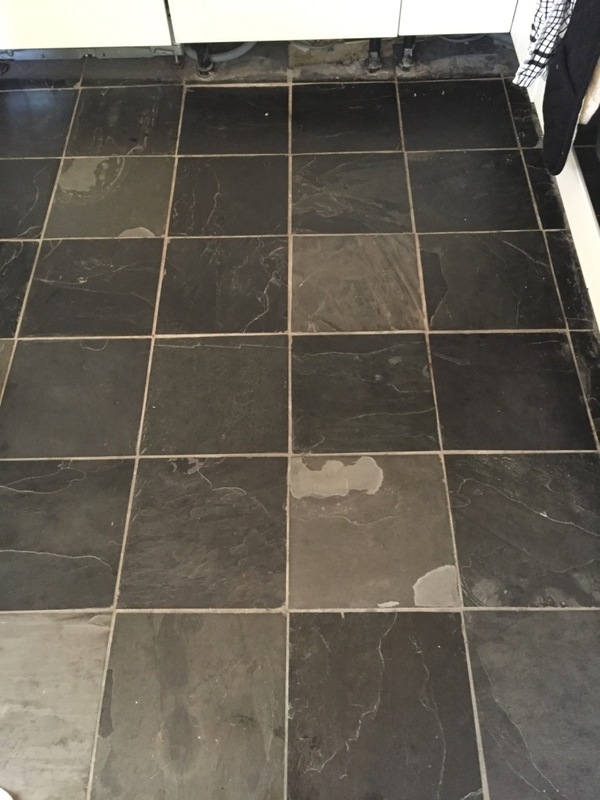 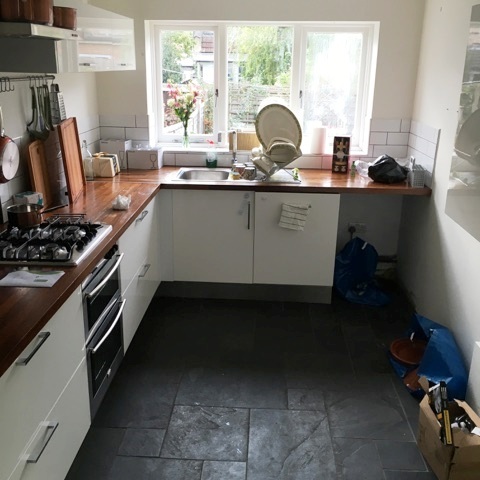 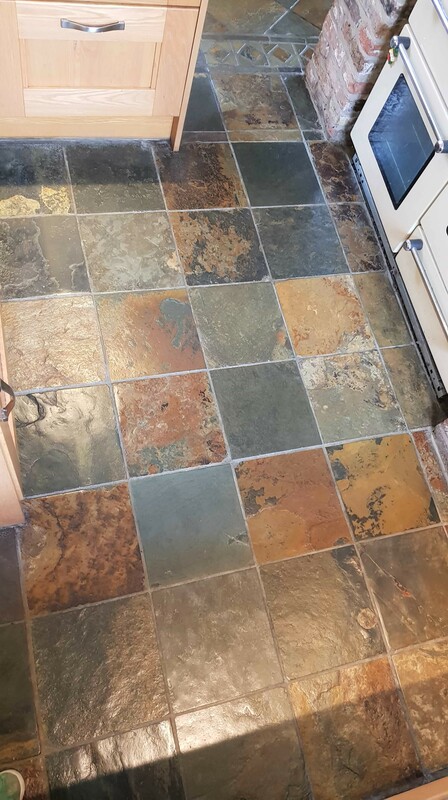 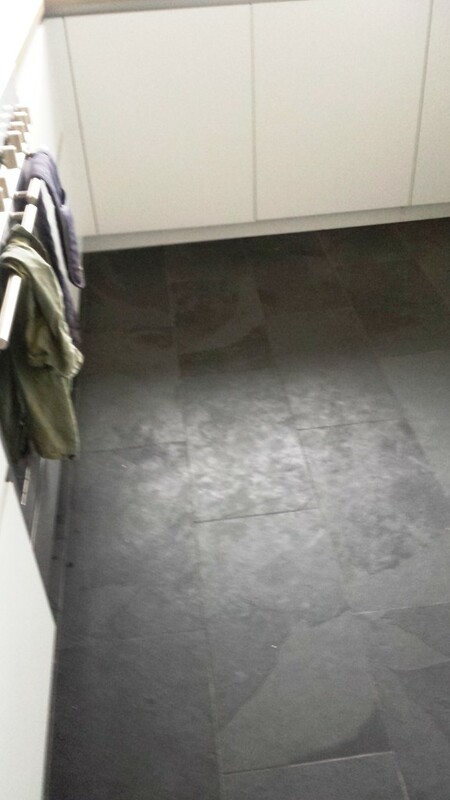 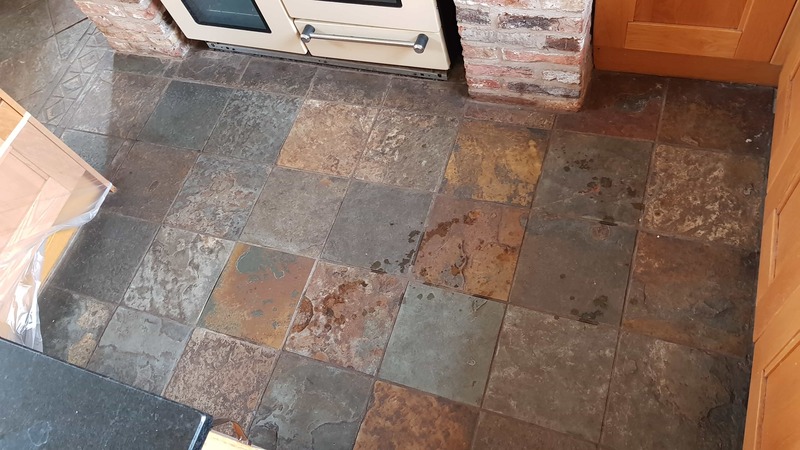 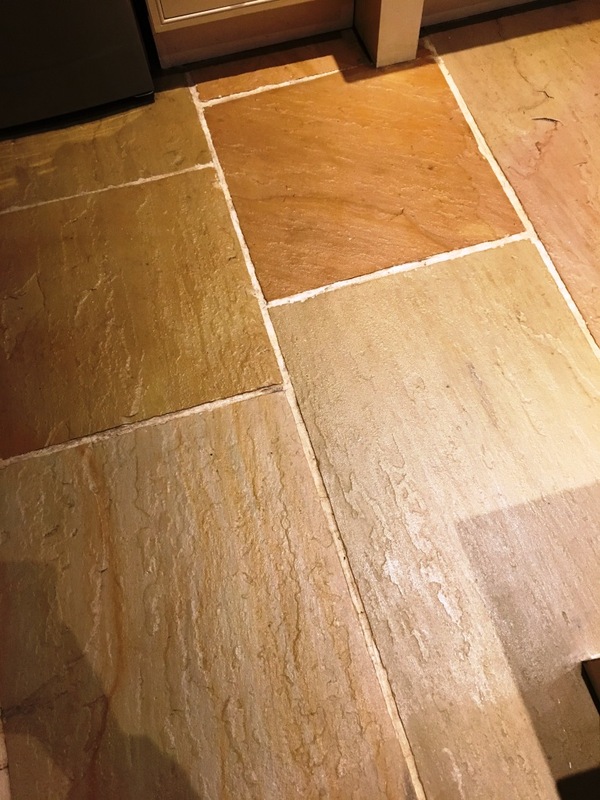 A builder has installed a new Slate tiled floor in the kitchen of this property, but had neglected to seal it, leaning the tiles exposed to dirt, stains, and other general muck so they quickly lost their appearance. 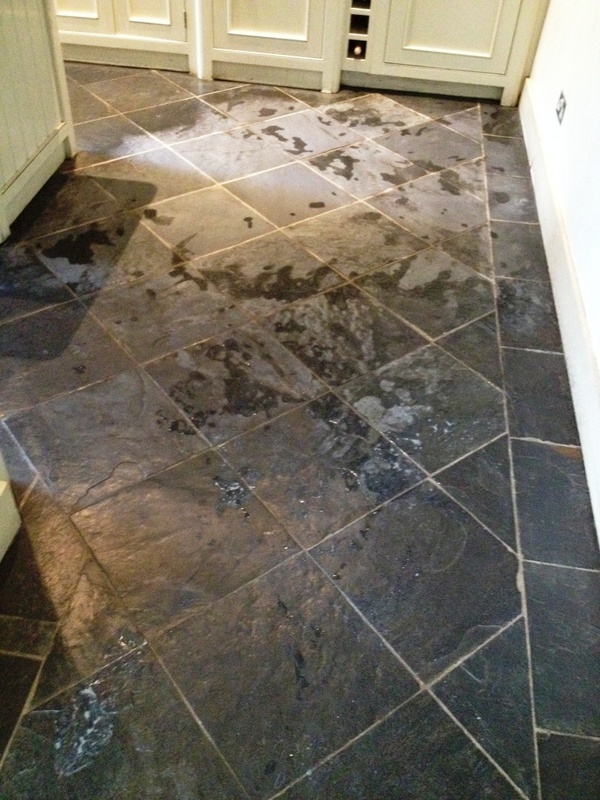 To be fair I could not fault the installation but the floor now looked terrible. 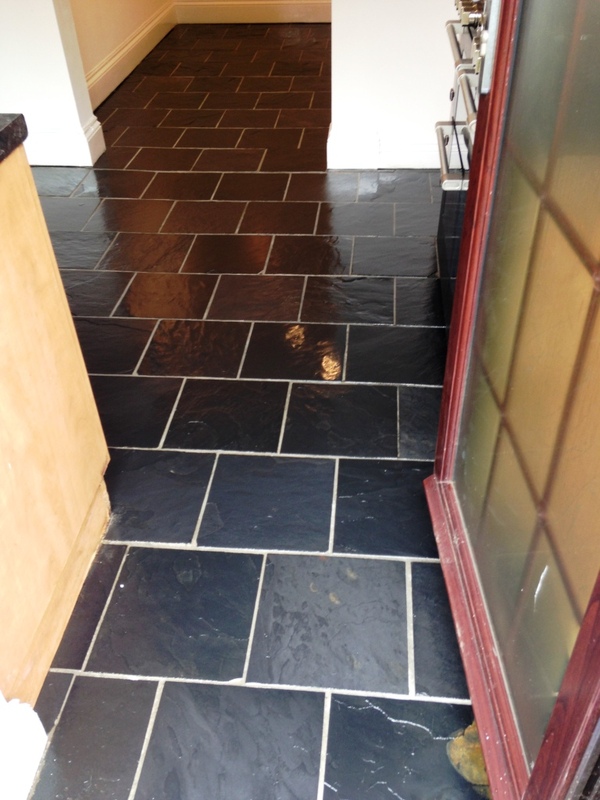 The property owner was keen to have the grubby Slate tiles refreshed and sealed, so she gave me a call. 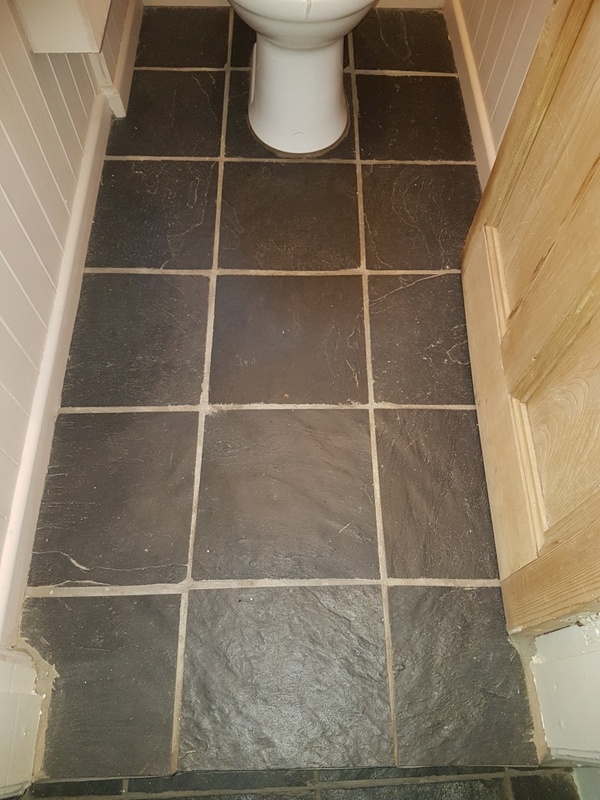 I agreed to complete the work and travelled to the property in Lymm – which incidentally means “place of running water” in Celtic – and was named after an ancient stream that ran through the village centre. 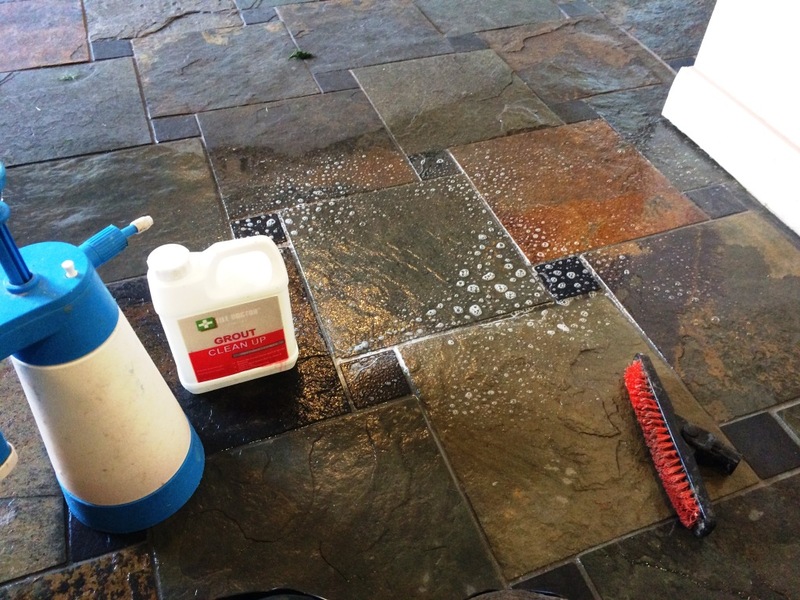 Upon my arrival at the property I got straight to work, cleaning the tiles with our heavy duty remover/cleaner, Tile Doctor Remove and Go. 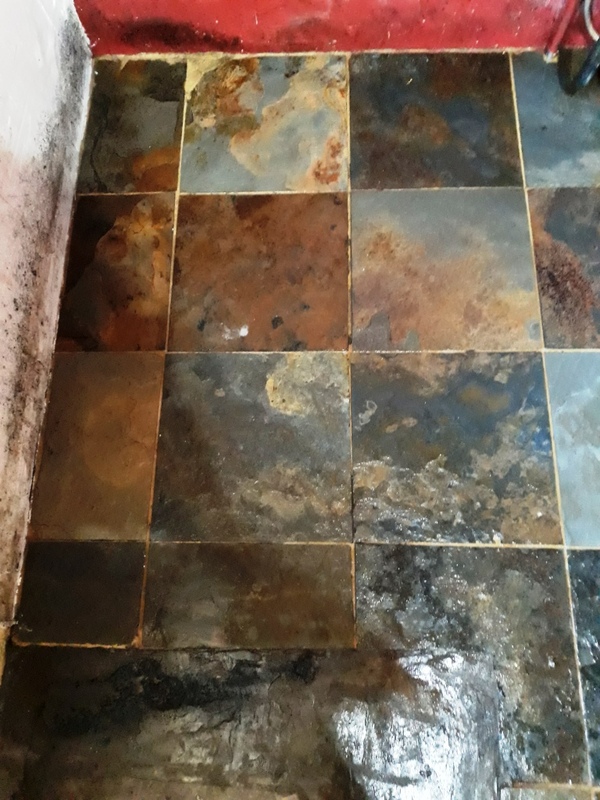 This was applied to the floor, left to soak in and then scrubbed into the tile using a rotary machine fitted with a black scrubbing pad to break down the layers of muck. 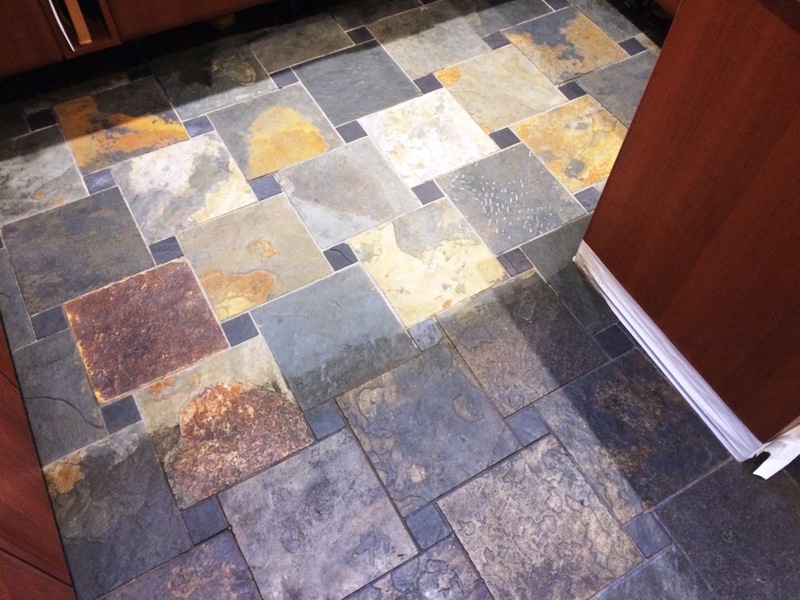 Normally I would use Remove and Go to strip away old coatings and sealers, but here of course there was no sealer to begin with just a lot of ingrained dirt. 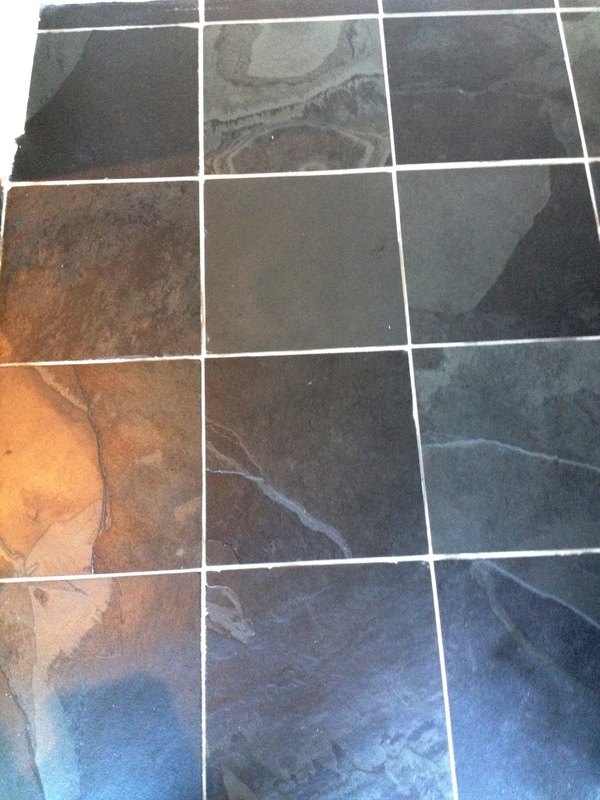 I also carefully scrubbed the grout lines with a special grout brush as I went along. 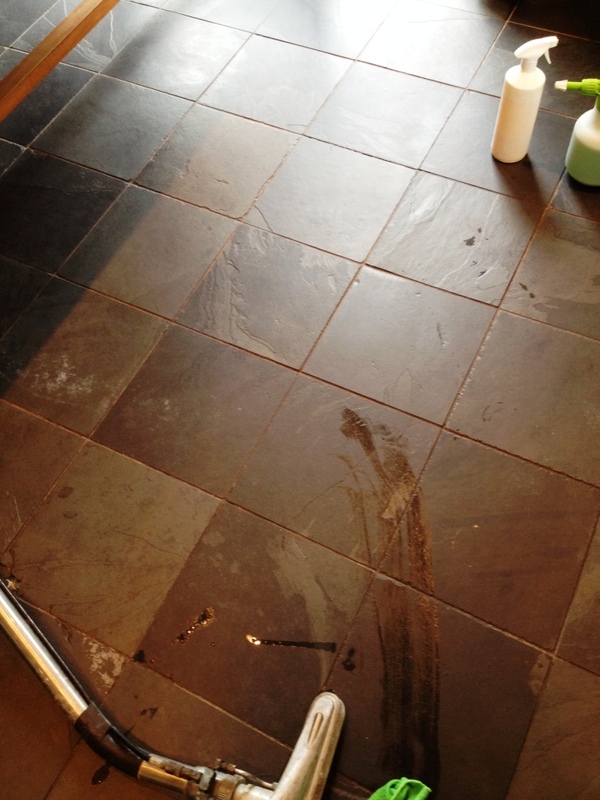 The grout lines are often where dirt can be come easily ingrained, and it was no different here. 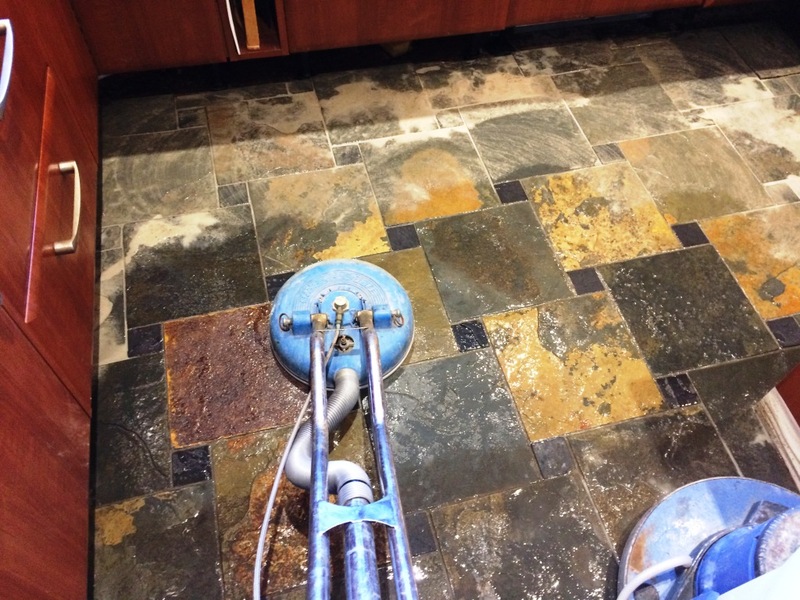 The floor was then rinsed off with clean water, and any resulting could residue was quickly removed using a wet vac machine. 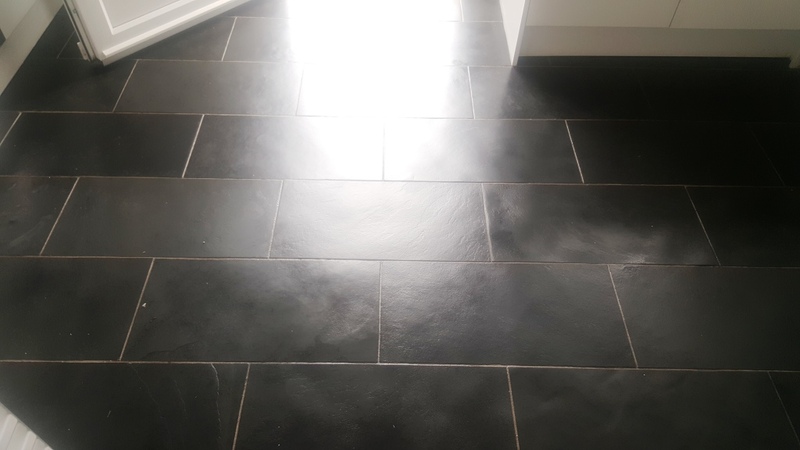 Finally, the floor was left to dry off overnight. 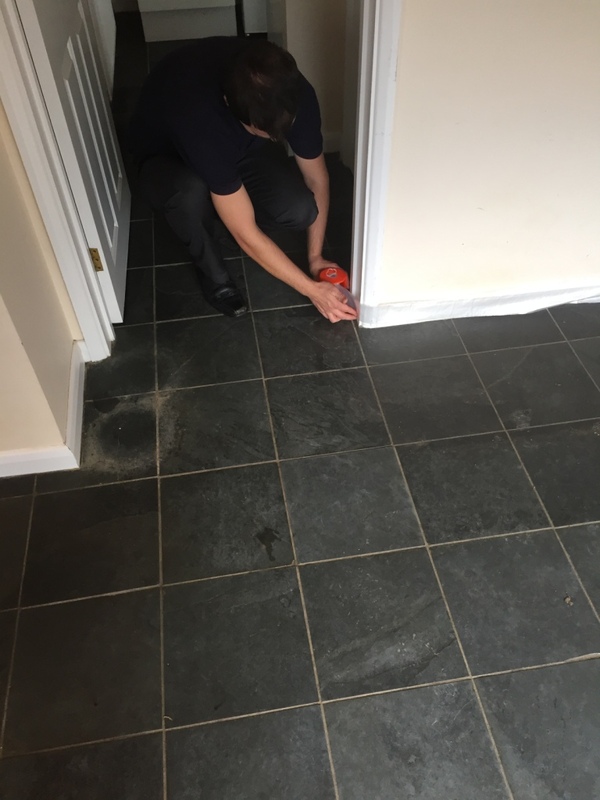 The next day I returned to the property and started by checking that the floor was completely dry and ready to be sealed. 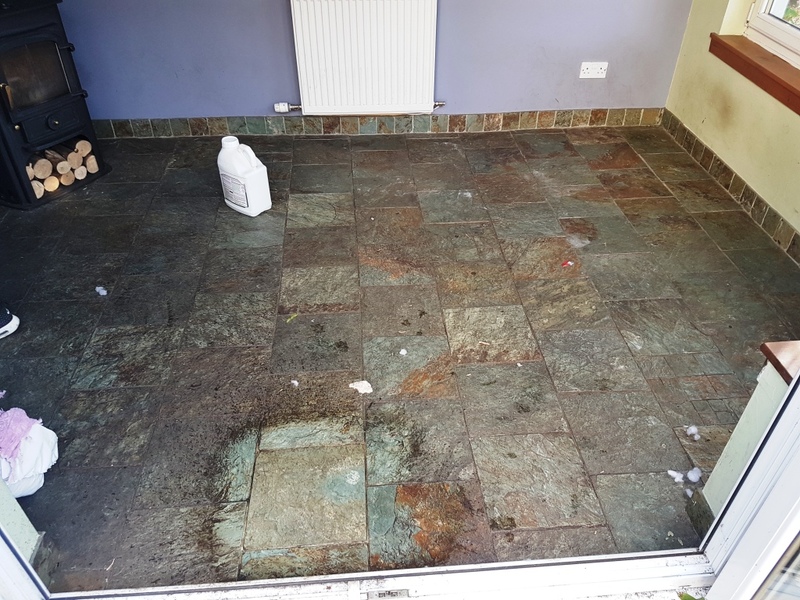 This involved running damp tests to check for excess moisture. 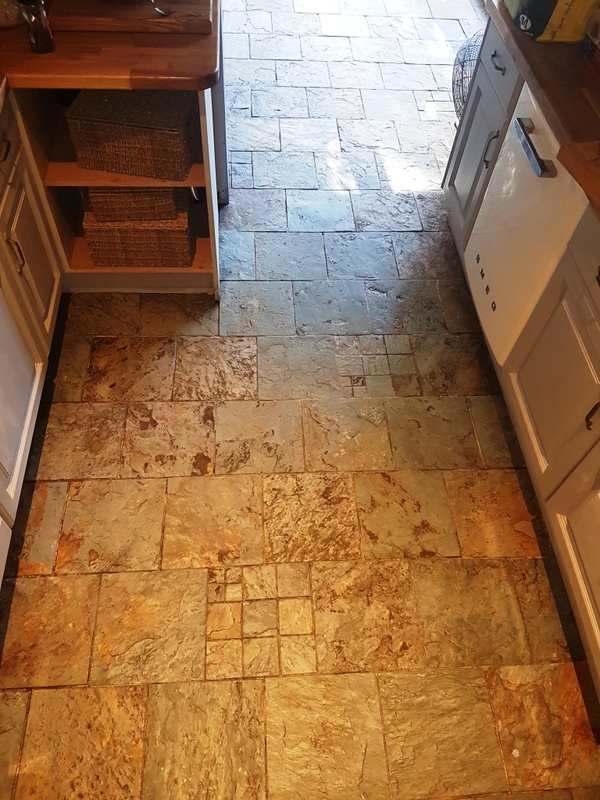 When satisfied, I proceeded to seal the floor with a single coat of our impregnating, colour enhancing sealer, Tile Doctor Colour Grow followed by two coats of Tile Doctor Seal and Go Extra, which gives the tiles a fantastic sheen finish. 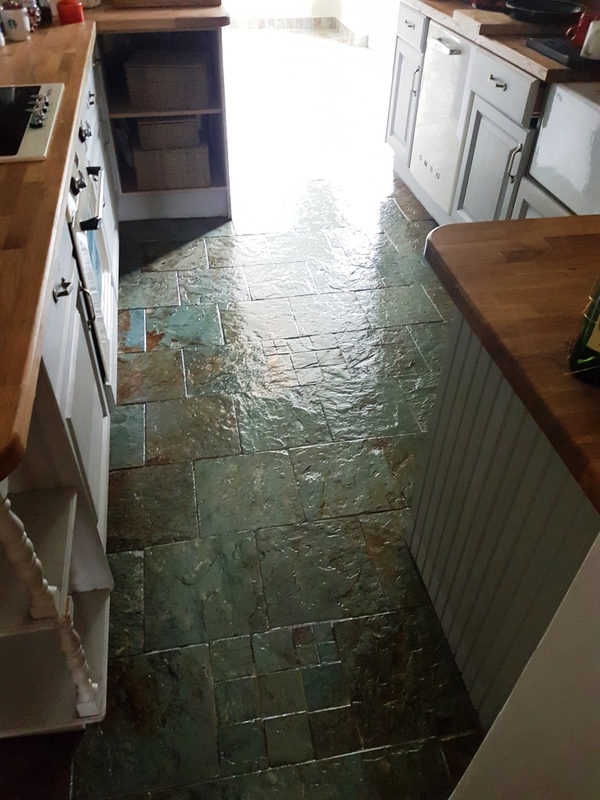 The customer requested for the grout lines to be recoloured, but first I had to leave the property overnight to allow the sealer to dry. 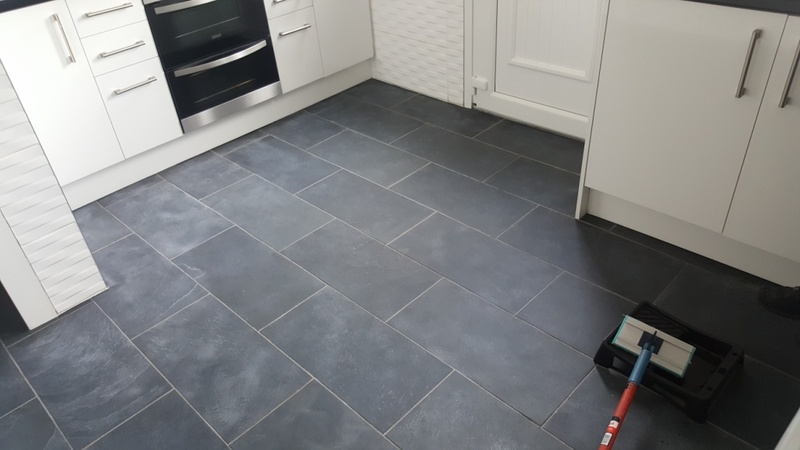 The next morning, I coloured the grout lines with white Tile Doctor Grout Colourant which is just a question of applying the colourant with a small brush and then wiping the excess off the tiles. 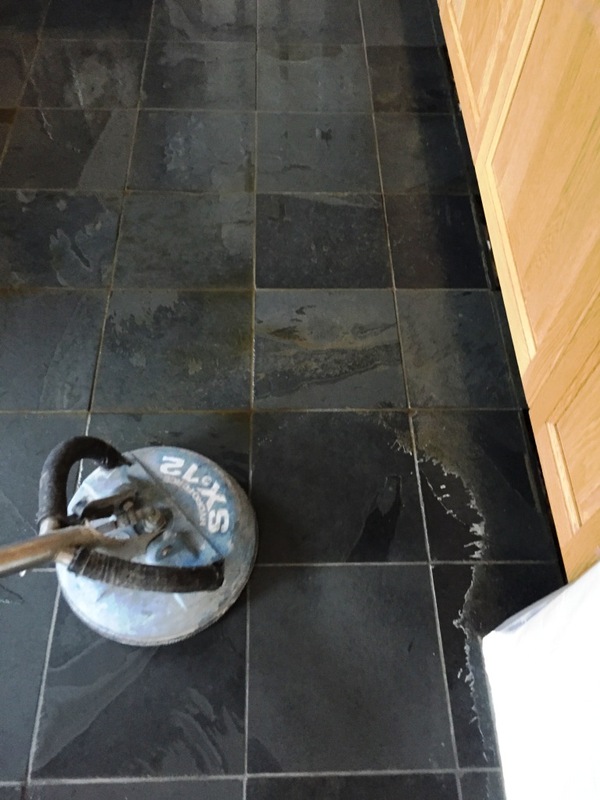 It’s not a tough job but it can be quite fiddley and it does make a real difference to the appearance of the grout. 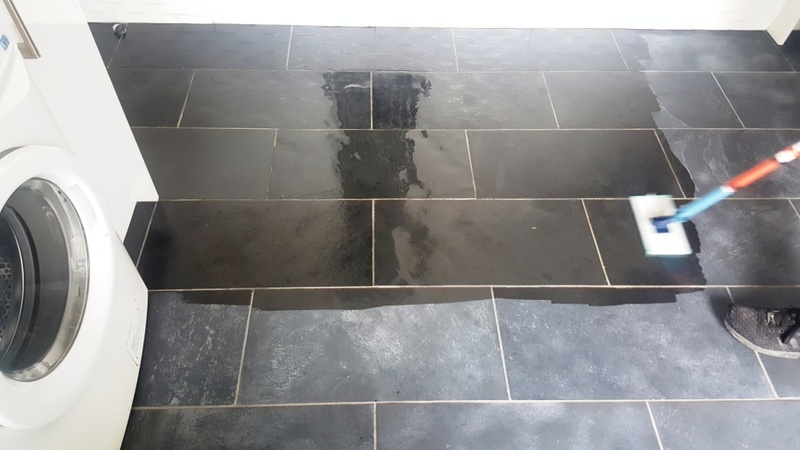 As you can see from the After photograph the white Grout Colourant contrasted very nicely against the naturally dark Slate. 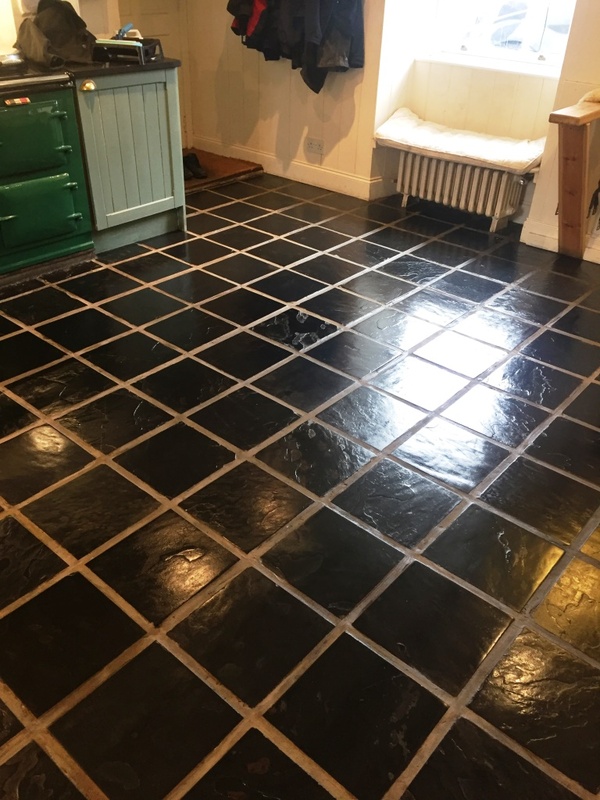 The absence of a sealer had left the floor looking very dull but now, with a fresh, robust seal, it has been completely revitalised. 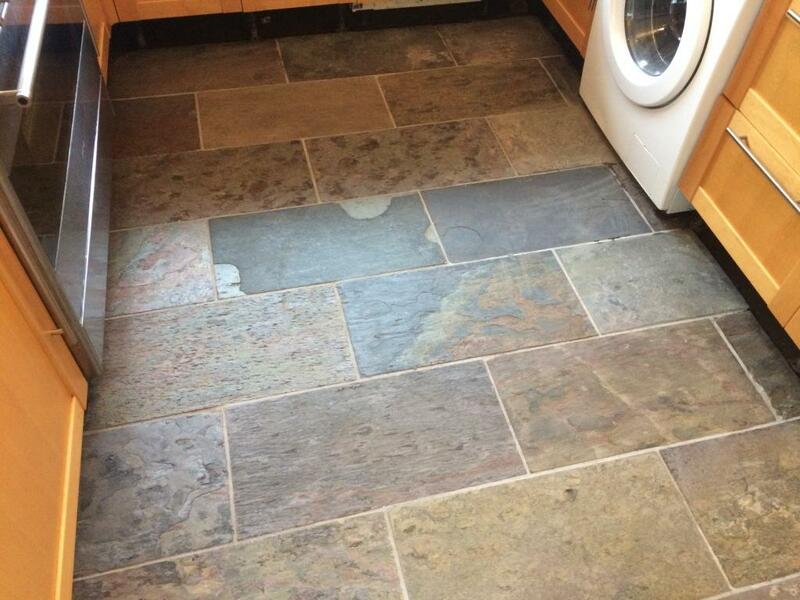 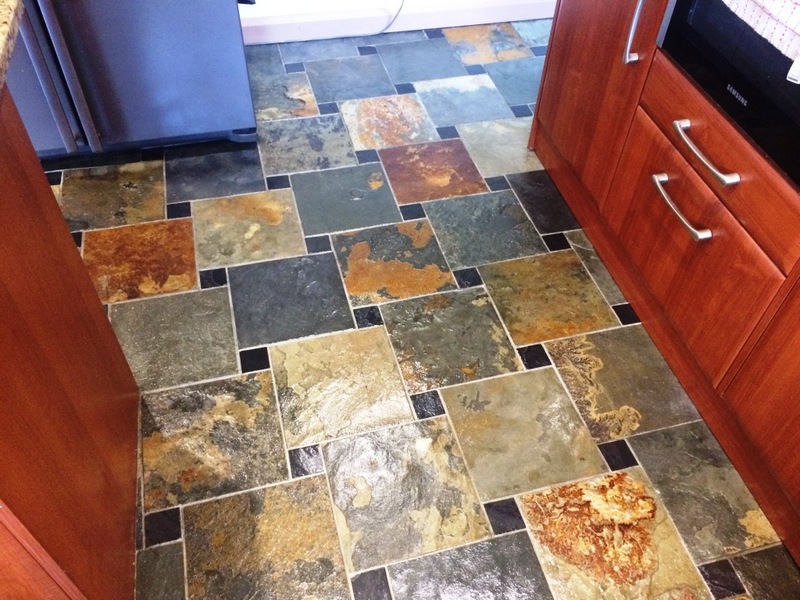 My customer was exceptionally pleased with her hugely improved kitchen floor.